Work has begun on the demolition of the two buildings on the Banbury Road which will be replaced by the massive brick structure of a 180-bed super-budget Easy Hotel. We are sure that everyone will recall that this development, which was inexplicably promoted by the Oxford City Council planning department and supported by a majority of the Councillors who could be bothered to attend the planning meeting, will be the largest Easy Hotel in the country. Local accountants Shaw Gibbs are speaking at a coffee morning on 'Striking the Balance – Later Life Expenditure and Tax Efficiency' which will address the issues involved in managing Inheritance Tax efficiency whilst retaining wealth for care fees. The event is at 10.30-12.00 on Tuesday 30 April at Fairfield Residential Home, 115a Banbury Road OX2 6LA. If you are interested in attending, please email reception@fairfieldhome.co.uk or call 01865 558413. Cherwell Boat House restaurant is holding a Domaine des Comtes Lafon Tasting Dinner at 7.30 for 8.00pm on Thursday 28 March. The six-course dinner, each course accompanied by wines from this producer of classic white burgundy, costs £128.00 per person and bookings can be made by following this link. And, if you feeling like some exercise, the punting season started last Saturday. Majestic Wine has opened its new shop on the old Starbucks site next to the Co-op. Given the space constraints there is a more limited selection of wines than in their previous location. Pompette has now attracted the attention of Jay Rayner in The Observer, who writes in his review that, 'This is cooking which makes its mark not through invention and fireworks, but by pressing into service knowledge of the classics and extremely good taste'. This image by Sophia Evans is from the review. Do you care for an elderly person? Fairfield Residential Home is holding a day of relaxation on Tuesday 26 March from 10am - 4pm to give those who care for elderly people a break. Carers will spend the day at Fairfield enjoying some quality time. A hairdresser and a podiatrist will be providing treatments during the day, or carers can read newspapers and magazines, watch television or a film, or just relax! Loved ones will be looked after by Fairfield's wonderful team. They will be able to sit with residents, join in with morning and afternoon activities, play a game or enjoy a hobby. Tea and coffee and a three-course lunch will be provided. This event is free of charge but numbers are limited and booking is essential. To find out more, and to book, call 01865 558413 or email reception@fairfieldhome.co.uk. We look forward to seeing you there. 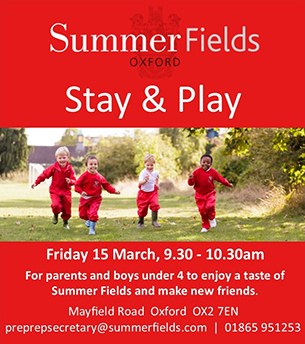 Summerfields is holding a Pre-Prep 'Stay and Play' event this coming Friday 15 March from 9.30 to 10.30am. See below for more details. Colombian Coffee Roasters opened their doors for the first time today, revealing a very smart new interior to the unit that was once occupied by The Book House. By lunchtime it was full of shoppers sampling the special varieties of coffee. We are delighted to say that our application to have two buildings in South Parade listed on the Oxford Heritage Asset Register has been successful. The old Co-op building which latterly housed Cibo, and Prospect House which is occupied by King Loose and formally also housed Bang & Olufsen, are now on the Register. This does not give them the same protection which is provided by Listed Building status, but it does mean that they have some protection as 'under the National Planning Policy Framework the conservation and contribution of locally listed heritage assets will be a material consideration in planning decisions that directly affect them or their setting'. Residents of Summertown and St Margaret's wards have received polling cards for the local referendum on the Neighbourhood Plan. Voting on the referendum takes place this Thursday, March 7th. The Plan is designed to help maintain and improve the character and amenity of this part of Oxford, and contains a set of policies which will have to be considered in any future planning decisions in the area. The full Plan, and a brief summary, can be read at NOA and the Summertown Library, or online at summertownstmargaretsforum.org.uk. You can also contact your local City Councillor. The Neighbourhood Forum very much hope you will want to support the plan by voting YES. We are sad to learn that Modern Baker is to close at the end of March. This is a great loss for Summertown both as a meeting place and a source of delicious and healthy food. The owners have decided to concentrate on their operation in Kidlington which undertakes research as well as supplying supermarkets. Waitrose's gain is our loss. The work on coverting the old Book House site into Colombian Coffee Roasters, which has taken far longer than anticipated, should now be completed by the end of February. Work will soon begin on fitting out the old Starbucks site as a temporary home for Majestic Wine. The roadworks on the Banbury Road to replace the old gas main with a new plastic pipe are causing fewer delays than had been feared. The are currently being managed so that there is always a lane open each way. From Monday 18 February the works will continue from Apsley Road to Rogers Street and the traffic will be controlled by traffic lights. It is expected this will cause delays both morning and evening. A Service of Thanksgiving for the life of Jean Fooks, and to celebrate the work she did to improve the lot of people in Summertown and Cuttleslowe, will be held on Saturday 2 February at 2pm in St Michael & All Angels Church in Lonsdale Road. All are very welcome. To help with seating it would be appreciated is those attending could email civicoffice@oxford.gov.uk so that enough seating is provided on the day. Carter Jonas has appointed Simon McConnell as Head of Residential Sales in Oxford, based at the firm's offices in Summertown. Mr McConnell has more than 30 years of residential property experience in the region and his brief is to expand the residential team's geographical reach as well as the wide range of services it provides to both vendors and buyers. He succeeds Mark Charter who joined Carter Jonas in 1991 and has recently been appointed as the firm's new Head of Rural in Oxford, also in Summertown. TOPS, which offers a range of health services including Physiotherapy, Yoga, Pilates, Sports Massage and Acupuncture, has started a walking group. It is open to all abilities and especially those who are not currently doing any exercise and would like to start in a friendly, relaxed, non-judgemental and supportive environment. The group meets every Thursday at their practice in Grove Street and then walks around the north Oxford area. The walks are from 1-2pm and cost £5 per person. Contact TOPS for more information. Cotswold Lodge Hotel has recently refurbished its restaurant and drawing room and is holding a Burns Night Supper this Friday, and a special Valentine's Day dinner to showcase the new restaurant. Grape Minds in South Parade has completed its re-fit and is once again open for business, with lots of good wine including a new range from Greece. There will be some tasting events over the next month, and you can book your place by ringing Michael or Graeme on 01865 661749 or emailing them at info@grapemindsdrinkalike.co.uk. Layla Moran is sadly unable to attend the final Climate Justice Campaign event on Friday 18 January at the North Oxford Association, Diamond Place, OX2 7DP. Her place will be taken by her Westminster spokesperson. Oxford restaurant group Full City Ltd, which runs the Mamma Mia Pizzerias in Summertown & Jericho, and the Perch Inn in Binsey, is saying thank you to it's customers for their generosity following their annual festive charity collection. Every December the group matches voluntary donations on restaurant reservations pound for pound. This year a total of £6404 was raised which will be split equally between Oxford Food Bank and Helen & Douglas House. Full City Limited's MD, Jon Ellse, said, "Our festive donations have been a tradition in our restaurants for many years now. To date we've donated close to £30,000. We just want to say a big thank you to our customers for not only supporting us, but also our two chosen charities". Giles Coren, restaurant critic at The Times, wrote a glowing review of Pompette in the Saturday edition and concluded, 'Pompette is a thing of wonder, a perfect bistro, a brilliant restaurant, a haven of great cooking, sweet service and wondrously original wine. I love it to pieces.' Book now! The final event for the Fairplay Climate Justice Campaign will be held on Friday 18 January from 7.30-9.00pm at the North Oxford Association, Diamond Place, OX2 7DP. Layla Moran, MP for Oxford West & Abingdon, and Professor Myles Allen, Head of Climate Dynamics at Oxford University, will speak on "What now for Climate Justice?" North Oxford Lawn Tennis Club Chairman Sarah Lacey and tournament organiser Neils Riddick handed over a cheque for £3389 to Tim Wraith of Sobell House in November. This followed a successful mixed doubles tennis tournament held in August. £1000 of this was donated by event sponsors Alberon whose MD, Tim Ault, was a runner-up in the tournament. The event attracted over 40 people who played throughout the day. The overall champions were Gail Buswell and Tom Bowden. Flash in the Pan with its wide range of art, crafts, textiles, books and comestibles is back! It will be open from 8 to 16 December from 10am to 6pm at 43 Oakthorpe Road, OX2 7BD. Do go along to find the perfect presents for Christmas. The best Christmas trees in Summertown are here! In the shed down the alley by the side of Oxfam at 223 Banbury Road. Great trees that will last until after Christmas. Open from now until 23 December from 10am to 6pm Get in touch on 07846 633 957 or flashtrees@gmail.com. We are very sad to hear that Jean Fooks has died. As a city councillor for Summertown and a county councillor for Summertown & Wolvercote, Jean worked tirelessly for over 25 years to help the communities she served. Many of the benefits we now enjoy are the result of her dedicated work. Jean finally retired in May this year, after holding her final post as Lord Mayor, but continued to give us and others helpful advice and support. She will be greatly missed. Having spent the summer tasting over 300 wines, Michael Jelley and Graeme Woodward will be opening Grape Minds as a pop-up from this Friday 30 November and on through December. There will be lots of wines to taste at 35 South Parade on the Opening weekend (30th, 1st & 2nd) and further tastings throughout December. They will then close for a short period in January to complete the fit-out of the shop. They are very much looking forward to meeting the local community. Further info can be found on their website. 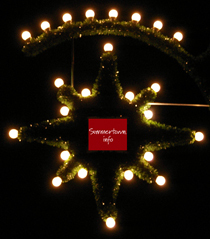 The Summertown Christmas Lights will be switched on at around 5.30 on Friday 7 December outside Carter Jonas. There will be music from St Edward's Brass Band and choirs from local schools from 4.45, and hot mince pies will be provided by the Co-op. This is a great family and community event. Do come along and join in the singing. There are a complete set of new lights this year; this picture is once again in memory of the old ones. This year's Art at Christmas collection will be at St Michael's Church Hall on Portland Road on Saturday 1 December and Sunday 2 December. It is open 10am to 5pm. This is a great place to find Christmas gifts for all your friends and family. Enjoy mulled wine, mince pies and gentle live music while you browse the stalls. Cherwell Boat House restaurant is holding a 'Christmas Before Christmas' Tasting Dinner at 7.30 for 8.00pm on Thursday 29 November. The six-course dinner costs £65.00 per person and bookings can be made by following this link. Oxford City Council will today decide whether to pay an initial sum of £8.85 million for new roads and infrastructure for the Oxford North development. This sum will then be recaimed from the developers but the total infrastructure cost is likely to be in excess of £100 million. A decision on the planning application is expected in the next few months. Pompette, the new restaurant on South Parade, will be opening its doors on Friday 16 November. On Friday evening there is a special offer of 50% off all food. Bookings can be made by emailing info@pompetterestaurant.co.uk or via their website at www.pompetterestaurant.co.uk. Newly formed Oxford company Grape Minds has applied for a liquor licence for 35 South Parade, recently occupied by Law & Co. The licence application is for the sale of drinks, for consumption both on and off the premises, from 08:00 to 22:00. The application can be found here. A weekend event of music, food and photographs from around the world in support of Asylum Welcome, Oxford's charity supporting aslyum seekers and refugees, is taking place at St Michael's church, Lonsdale Road on the evening of Friday 23 November and the morning of Saturday 24 November. Tickets for Friday cost £8 and include a drink and food. Tickets for Saturday include coffee and cake and cost £5. As part of the Fairplay Climate Justice Campaign, Witney's Voice Box Choir will be giving a free concert on Sunday 18 November at 3pm at St Peter's Church, First Turn, OX2 8AQ. Children in the audience will be encouraged to participate in the singing. Donations welcome. Rebecca Bowler, Hintze Research Fellow at Oxford University, will be giving a talk entitled 'The Universe: the First Billion Years' on Thursday 15 November at 6pm at the newly renovated Summertown Library. The talk will be an illustrated tour of the early universe. Entry is free. Donations at the door to the work of the Friends will be gratefully received. Portabello restaurant in South Parade has closed its doors after 16 years of providing delicious food for the residents of Summertown. Co-owner Jon Ellse said, 'We have had a fabulous 16 years at Portabello but the time is now right for us to focus on new ventures'. The new chef owner has already moved in, and expects to open French brasserie Pompette in late November. 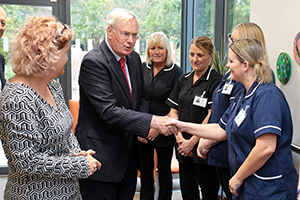 His Royal Highness the Duke of Gloucester officially opened the new Fairfield Residential Care Home on Thursday 11 October. The Duke was welcomed by John Cole, Chair of the Trustees, and the home's manager, Debbie Hayes, who then took him on a tour of the new home. The Duke was shown one of the 38 en suite bedrooms as well as the new assisted bathroom facilities, before visiting the dining room, lounge and hub areas. The newly-built home caters the active elderly with staff providing personalised care and promoting independence whilst maintaining an appropriate level of safety and supervision. The application to build a 180-bed Easyhotel super-budget hotel in Summertown was approved last night at a meeting of the West Area Planning Committee. The councillors on the committee voted 3 to 2 in favour of the application with 4 abstentions. We learn that Majestic expect to be in the current building until at least January which suggests work will begin in the spring. The Chapel Choirs of St Edward's School and St Edward's Singers are looking forward to taking part in the performance of Haydn's "Creation" with The Orchestra of Time and Truth and conducted by Neville Creed. The concert at the church of St Michael & All Angels, Lonsdale Road is on Sunday 14 October at 7pm. The concert is free but donations to the Climate Justice Campaign are welcome. Deborah Gill, Professor of Gene Medicine at the JR, will be giving a talk on Thursday 11 October at 6pm at the newly renovated Summertown Library. The talk reviews some of the less-publicised advances being made in gene medicine. Entry is free. Donations of £10 at the door to the work of the Friends will be gratefully received. As part of the Fairplay Climate Justice Campaign, Carol Wills (past Chair of the Oxford Fair Trade Coaliton), will be giving an illustrated lecture followed by tea and a discussion on 'How is FairTrade faring in a changing world?' The lecture is on Friday 12 October at 3.30pm at the United Reformed Church, Banbury Road, OX2 7HN. £5.00 on the door to support the URC Building Fund. There will also be a performance of Haydn's "Creation" with the Chapel Choirs of St Edwardâs School, the St Edwardâs Singers, and The Orchestra of Time and Truth - Oxford's world-class period instrument ensemble - conducted by Neville Creed. The concert is on Sunday 14 October at 7pm at St Michael & All Angels Church, Lonsdale Rd OX2 7ES. Donations welcome. St Michael and All Angels in Lonsdale Road has been shortlisted for the President's Award in the 2018 Church Architecture Awards. The judges responded very enthusiastically to their new west end extention, or narthex, known as the Threshold. The new structure houses an entrance hall, a kitchen and an office. Winning entries will be revealed at a ceremony in London on 1 November..
Zakti Active has a closing down sale, but in one way they are not leaving. Once the stock has cleared, the shop will be re-branded as Mountain Warehouse, the company which owns the Zakti Active brand. The new stock will be mostly Mountain Warehouse but there will still be an area selling Zakti Active products. 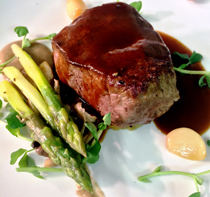 Restaurant 66A at the Cotswold Lodge Hotel has launched a new Sunday lunch menu. With new starters and a range of roasts it promises a delicious meal to share with friends and family. A planning application has been submitted to convert the shop recently occupied by The Book House into a café for gourmet coffee outlet Colombia Coffee Roasters who currently have a unit at the Covered Market and often have a stall at Summertown Farmers Market. The application number is 18/01997/FUL and comments have to made by 23 September. On Thursday 20 September from 7:30-10:30pm KingB will be performing their electric blues at Cherwell Boathouse. Tickets cost £17.50 and include a welcome drink. Book now using this link. Developers have submitted a new revised application for the proposed Easy Hotel development. The reference number: 17/02832/FUL is the same as for the previous revised application. The revised plans can be found on the planning website at: http://public.oxford.gov.uk/online-applications/applicationDetails.do?keyVal=OYBP0IMF10F00&activeTab=summary. Everything dated 4 September or after relates to the revised application. The consultation period ends on 27 September. If you would like to be kept in touch with this and other developments in Summertown, please send your full name and email address to info@summertown.info. Mathnasium, the new maths tutoring company, opens its doors tomorrow at 18 South Parade with information and refreshments for everyone. The company say that they make sense of maths and help children catch up or get ahead. The planning application for Easy Hotel will not be heard at the West Area Planning Committee meeting on 11 September. It is possible it may be presented to the meeting on 9 October. If you would like to be kept in touch with this and other developments in Summertown, please send your full name and email address to info@summertown.info. The new bar and restaurant, on the Banbury Road site previously occupied by Saffron, will be called The Bicycle Shed and will be opening in October. The menu will have a large number of vegetarian and vegan dishes using local produce, and the drinks list will feature craft beers, including offerings from local breweries, as well as cocktails and wine. A brunch/lunch menu will be served from 10:00, and there will be a separate dinner menu. As part of the Fairplay Climate Justice Campaign, Sarah Rowe from the Christian Aid Campaigns Office, will be giving an illustrated talk on 'Fossil Fuel and Climate Justice: what part do the banks play?' The talk is on Monday 17 September at 7pm in The Threshold at St Michael & All Angels Church in Lonsdale Road (OX2 7ES), and will be followed by a discussion. Local yoga teacher Lucy Tennyson, who has taught in Oxford and Abingdon for six years, is launching a new class in Summertown aimed at beginners and less mobile people. Unlike many regular yoga classes, which are more suited to already flexible and younger students, Lucy's approach is slower and allows people to work at a pace suited to their health needs. The first class takes place at the URC Church Hall, Banbury Road (opposite the BBC) on Tuesday 18 September from 4.15-5.15pm. The hall is bright and airy and has a lovely sprung wooden floor. All equipment is provided, just wear something comfortable. To find out more, or let her know you are coming please contact her on 07715207784 and see www.lucytennyson.com. Katy Cullum is starting a new Zumba class at Cherwell School (North Site) on the Marston Ferry Road on Thursdays at 7.30pm. The first class is on 6 September. Katy describes the class as a 'fun Latin inspired dance exercise class - great for the body and mind!' All levels are welcome. There is no need to book but please contact her on 07403891791 or katycullum@gmail.com for more information. A planning application has been submitted, by Edward Horn, to build a low-rise block of four two-bedroom flats behind 6 South Parade. This is the half of the Georgian house that was once occupied by Horns and latterly by Bang & Olufsen. The flats have been designed so that they are not intrusive and so that a corresponding block could be built behind 5 South Parade. There is provision for a bike shelter but not for car parking. You can view the application using this link. The consultation period ends on 10 September. 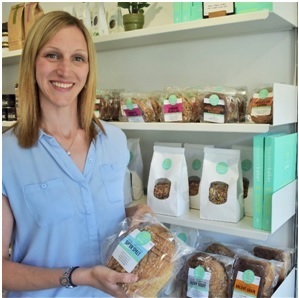 Modern Baker, familiar to Summertown residents as the café on Banbury Road, has won a £100,000 funding award from the UK's Innovation Agency, Innovate UK, to explore the impact on the human digestive system of freezing their long-fermented baked products. The project, in conjunction with Campden BRI, will evaluate the effect of different freezing processes on the starches in Modern Baker's baked products, and the effect that has on blood glucose levels and nutrition. The company launched a range of sliced loaves a year ago following research, also funded by Innovate UK, to improve the quality of dietary carbohydrates. The company has recently named Kate Voss as its new Chief Operating Officer, as it starts talks with multiple retailers to stock its brand. Ms Voss arrives at Modern Baker after 13 years at Innocent Drinks. The long-fermented, clean-label breads, cakes and biscuits are currently available mainly in independent food retailers including Planet Organic and Selfridges, as well as at their Summertown café. Marston Ferry Road is planned to be closed in both directions from Banbury Road to Oxford Road until Saturday 25th August for road works to take place. Reports this morning suggest that it will be closing at 10am each morning to allow commuter traffic to use the road but that may not be the case all week. A summer party at Rhodes House, organised by graduates at Carter Jonas in Summertown, raised £1280 for the SeeSaw charity. 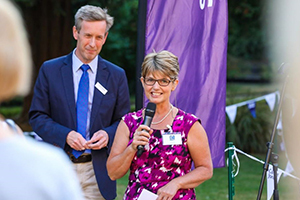 Jane Elliott, pictured with Mark Charter of Carter Jonas, told the assembled guests about the charity's work with bereaved children in Oxfordshire. On Saturday 11 August from 3:00pm Thirtyeight and some Summertown 'locals' are hosting a fun and free tennis tournament at the Alexandra Courts off Middle Way. Once the tennis is over you can head down to Thirtyeight, 38 South Parade, for a BBQ for just Â£5 per person. If you would like to join in, ring 07305892301 to say if you would like to join in both of the events, just the free tennis, or just the BBQ. Law and Co., the clothes shop on South Parade, has closed down. 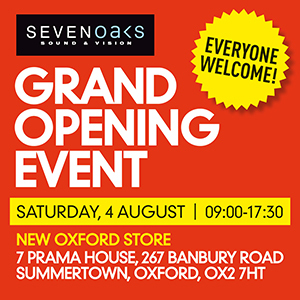 After 20 years in St Clements, Sevenoaks Sound and Vision's Oxford store is opening in Summertown on Saturday 4 August. The new shop is at 7 Prama House, 267 Banbury Road, just round the corner from South Parade. To celebrate the opening there will be demonstrations of high quality home entertainment systems from the likes of Naim, Bowers & Wilkins, NAD, Bluesound, Sony, Yamaha and Pro-Ject Audio, along with exclusive offers and a prize draw, as well as 'bubbles and nibbles' from 09:00 to 17:30. Rob Lawley, Managing Director of Sevenoaks Sound and Vision said, 'As part of our company expansion strategy we chose Summertown as a premium and relevant area. We believe it's where our local customers live, as well as being in an easy to access location for people who are travelling from the broader area around Oxford'. 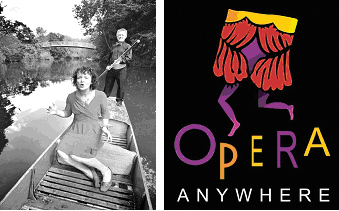 On Sunday 22 July from 5:00-7:30pm Cherwell Boathouse is presenting the third iteration of Opera on Punts with Opera Anywhere. It promises to be a magical evening with chauffered punts and a delicious picnic. Booking is essential and closes at 12 noon on 21 July. Book now using this link. The application to build a super-budget Easy Hotel in Summertown will not be discussed at the July meeting of the West Area Planning Committee. It is likely that it will be presented at the next meeting on 11 September. Audio store Sevenoaks will open it's doors, in the shop on the Banbury Road previously occupied by In Toto, on Saturday 4 August. There will be demonstrations of high quality home entertainment systems and exclusive offers, as well as 'bubbles and nibbles' from 09:00 to 17:30. After an extensive overhaul lasting six weeks, Summertown Library has re-opened with a redecorated entrance, new signage and cycle racks. Inside it has new shelving, an expanded children's section, and new work desks, carpeting, tables and décor. The Friends of Summertown Library are very keen that people make use of the splendid new facilities. The residents of Fairfield moved into their new care home on the Banbury Road on 3 July, at the end of a two-year building programme which they have watched take shape from the original Fairfield. After 70 years in the Victorian building on the Banbury Road, the new Fairfield is a brand new, purpose-built care home, situated just behind the original house. The new home offers residents a modern, spacious environment with quality facilities and continuing high standards of care, and has been designed with all the facilities required to provide a homely environment for its elderly residents, along with 24-hour residential and respite care. It has 38 en-suite bedrooms, some of which are suitable for couples. Fairfield has released a number of rooms that are now available to new residents, including some that are suitable for couples. They are also offering bookable short-term respite care over the summer. For further information visit www.fairfieldhome.co.uk. Everything dated 22 June or after relates to the revised application. The consultation period ends on 19 July. Please do comment on the revised application on the planning website by the deadline of 19 July. If you would like to be kept in touch with this and other developments in Summertown, please send your full name and email address to info@summertown.info. We learn that Easy Hotel will shortly be submitting a revised application for putting a hotel on the Banbury Road site now only occupied by Majestic and two families in the flats. Notices are expected to go up soon to begin the statutory consultation period. If you would like to be kept in touch with this and other developments in Summertown, please send your full name and email address to info@summertown.info. The first North Oxford Food Festival will be held at the Harlequin RFU Ground on the Marston Ferry Road on Saturday the 7th and Sunday the 8th of July. There will be over 75 food and drink stalls, bouncy castles, water zorbs, a visit from a fire enginne, face painting and much more. The bar will be open in the rugby club. Entry is free. Further to our item on 18 June, Thomas White Oxford (TWO), the development company behind Oxford North, is carrying out a public consultation to seek the public's views on the proposed plans for Oxford North before it applies for outline consent for the overall masterplan and detailed consent for the first phase of development. These applications will be submitted at the end of July 2018. Once the application has been submitted, Oxford City Council will carry out its own statutory consultation exercise. TWO has launched a website where the documents can be viewed and which has a link to an online consultation to help gather people's thoughts on the proposals for Oxford North. Go to www.oxfordnorth.com and follow the link to 'Join the Conversation'. This consultation will close at 11pm on Sunday 22 July 2018. Wednesday 4th July 2018 - 3pm to 7pm - Jury's Inn, Godstow Road, Oxford, OX2 8AL. We hear that the shop previously occupied by In Toto on the Banbury Road is being fitted out for an 'audio and digital' shop. We are not sure what form that will take but new shope are certainly welcome at the moment. Always wanted to write a novel but didn't know how to start? Plot Wizard, recently launched by Renée Holler, can give you all the help you need with structure, plot, setting, characters and more. As Renée says 'this is not a creative writing course, but I will teach you the techniques and science of writing'. There is more information here and you can email her at reneeholler@gmail.com. The North Wall Gallery in South Parade has just opened an extraordinary exhibition of photographs and rare archive material celebrating the 100th anniversary of the founding of the RAF. It also marks the outstanding contribution of several St Edward's pupils, including Douglas Bader, Louis Strange and Geoffrey de Havilland. The exhibition runs until the 17th of July and entry is free. A new brochure entitled 'Oxford's New Urban District' has appeared, setting out the developer's vision for what was Northern Gateway and is now 'Oxford North'. The space between the railway line and the west side of the A40 will contain 500 new homes for 1,500 people ('a proportion of which will be affordable'), businesses providing 4,500 jobs, and another new hotel. There is lots of green space and a large community hall. The A40 and A44 will be converted into 30mph tree-lined avenues with lots of pedestrian crossings. We hope the traffic authority has plans in place to accomodate the extra traffic created and the slowing down of one of the busiest trunk roads in the couuntry. The over-subscribed local schools are also helpfully marked on the plan. There is an interesting mix of buildings and Oxford North could be a useful addition to Oxford, providing these problems are addressed. Help Low Carbon Oxford North and Fairplay launch the latter's Climate Justice Campaign at a talk given by Paul Valentin, International Director of Christian Aid, in the Dining Hall at Cherwell School (south side) on Monday 25 June at 7.45pm. On Sunday 24 June 2018 from 4:30 for 5.00pm Cherwell Boathouse presents 'Winetown', an evening of poetry and musical improvisations in the Lower Boathouse performed by Nicola Harrison and Gerard Cousins, to 'celebrate the glorious grape'. Tickets cost £35.00 and include appetisers and five featured wines. Book now using this link. The much-loved Summertown bookshop closed its doors for the last time today. It will be sadly missed. Wild Honey's new in-store nutritionist, Daniella Luan, will now be on hand from 11.00-12.30 every Wednesday to offer free expert health advice, consultations and guidance to all of their customers. Starbucks on the Banbury Road in Summertown has closed overnight without any warning. The website still lists Summertown as a location but their Facebook page says that it has closed. No-one knows if this is normal procedure for Starbucks as it is very unusal for them to close a site. There is now another empty shop in Summertown. The old Carphone Warehouse site on the Banbury Road is being converted into an undertakers by C. S. Boswell, an independent funeral director from Kidlington, and one of the few independents remaining in the business. All being well, the Post Office counter is due to open on Monday 4 June at 11am. The Cherwell Boat House is hosting a Quinta de La Rosa Tasting Dinner on Thursday 7 June at 7.30pm. Six delicious courses will be accompanied by very special matching wines from one of Portugal's most famous producers and owner of the Estate, Sophia Bergqvist, will be there to guide you through the entire range. The dinner costs £45. Ring 01865 552746 or email this address to book. It appears that Saffron restaurant, which closed on 6 May, may be replaced by another bar or restaurant. An application to vary the licence granted to Saffron has been made by The City Pub Group Plc. Comments on the application must be made by 4 June. On Thursday 31 May 2018 from7:30-10:30pm Cherwell Boathouse is hosting an evening of short plays in the Lower Boathouse. Tickets cost £22.50 and include a welcome drink. Book now using this link.Food can be ordered on the night. A website set up by an Oxford grandmother is proving you don't need to leave the house to feel a little less alone. Summertown resident Avril Lethbridge, 83, created her own website - Silver Robin - to communicate with the increasing number of over-65s using the internet. The site features articles on everything from arts and crafts to memories, to the explanation of modern tools such as Skype and YouTube. The website was put together with the support of Age UK Oxfordshire and other volunteers living in the area. Anyone interested in reading the stories and information, or sending in their own stories and snapshots, should visit www.silverrobin.co.uk. We understand that, as a result of the planned demolition for the proposed Easy Hotel development, Knight Frank will be moving into 274 Banbury Road, previously occupied by Breckon & Breckon. A casualty of the proposed development is local independent Wallers of Oxford who will be leaving their Summertown premises on 5 June. 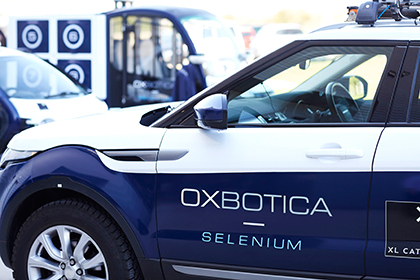 Summertown-based Oxbotica are developing the next generation of autonomous vehicles, in association with the DRIVEN project, which will see a fleet of driverless cars being deployed in urban areas and on motorways, culminating in journeys between London and Oxford in 2019. DRIVEN's fleet of vehicles can currently be seen conducting urban trials around the streets of Oxford. The wide-area road testing of the fleet is due to start in late-summer 2018. The FoSL have announced that they have succeeded in achieving their fundraising target of £90,000. Work can now begin in the summer on adding an expanded children's section and upgraded computers, and also installing movable bookshelves to create an event space for up to 80 people. At the same time the front of the building will be revamped and the inside decorated. On Sunday 6 May 2018 from 5:00-6:30pm Cherwell Boathouse is hosting alternative Folk & Blues singer Jess Bishop accompanied by Max Rafferty on guitar, live in the Lower Boathouse. Tickets cost £12 and include a welcome drink. Book now using this link. The new restaurant at 38 South Parade has continued with its soft opening of the café part of the building, while the work on the restaurant continues. The restaurant is owned by the company behind the small chain of Bacaro Italian restaurants. A recent application to vary the licence to allow live music and late night opening every day has been withdrawn but we understand that an application to change the name, and change the use from café to restaurant, will still have to be approved before it can formally open. Wild Honey's new in-store nutritionist, Daniella Luan, will be on hand from 12-2 every Wednesday over the coming weeks to offer free expert health advice, consultations and guidance to all of their customers. The Oxford Cat Clinic is having a Feline Fun Day on 2 June 2018 from 1-4pm at their Marston Clinic. Tour behind the scenes of a cat hospital. Enjoy talks about Creating a Cat-Friendly Home. Meet the team and much much more. A fun day out for all the family, with face painting, BBQ, 'Bring and Buy' cake sale, and our colouring competition with prizes! Entry is free. Carter Jonas has expanded its Planning & Development team with the appointment of Peter Canavan to its Summertown office. Mr Canavan brings a wealth of experience to the post as he was latterly principal planning officer at South Oxfordshire District Council, where he coordinated the production of the emerging South Oxfordshire Local Plan, as well as supporting several Neighbourhood Development Plan groups. Wine lovers will be delighted by the announcement that Majestic will stay open until 'at least September'. The shop had been going to close by June to make way for demolition of the building and the subsequent erection of an Easy Hotel. The restaurant/café, 38 South Parade, which is replacing The Oxford Wine Café, has begun opening in a limited way for the sale of coffee and drinks. It is still not clear when it will be fully operational. The business has applied for extensive variation in its licence so that it has the option of extended opening with live and recorded music every day. This is causing concern to neighbouring properties including St Edward's School, and the application is also opposed by the City Council's Environment service. The planning application for change of use for the old Paolo Gianni premises to a maths tuition centre has received approval and the company, Mathnasium Learning Centres, has now applied to erect internal and external illuminated signs. Christopher and Angela Legge of Legge Oriental Carpets will be exhibiting at the Cotswolds Art & Antiques Fair at Blenheim Place from Thursday 19th to Sunday 22nd April from 10.00am to 5.30pm. Please email Angela if you would like a free entry ticket. We are very sorry to learn that The Book House is to close in June after many years on that site. It was a destination shop for many people in Summertown, and everyone who went there enjoyed the surprisingly comprehensive stock and the welcome from the wonderful staff. It is a victim of the increase in internet shopping and the resulting reduced footfall. It will be greatly missed. Fairplay is organising a talk on Climate Justice on Sunday 29 April at 7.15pm at St Michael & All Angels Church, Lonsdale Road. The Rev Dr Rachel Mash will be speaking from her experience over many years as an activist at national and local levels for care and sustainability of the environment in Southern Africa. She is Environmental Coordinator for the Anglican Church of Southern Africa, which last year voted to disinvest in fossil fuels. All welcome. In addition to the Post Office, which is being established in the Co-op, and should be open in June, the store will also be hosting a Chozen noodle bar and a Subway counter. Noodles should be available from the beginning of May and long sandwiches from June. The site previously occupied by Carphone Warehouse will soon become a financial services provider. The signs indicate that work will begin soon to transform the interior. We gather that the shop vacated by Paolo Gianni will not become a centre for maths tuition. Fairfield is holding two open days at its new care home on Saturday 21 April and Wednesday 2 May from 10am to 4pm for prospective residents and their families as well as anyone who would like to see inside the new home. After 60 years in its current Victorian building on the Banbury Road, Fairfield is moving into a brand new, purpose-built care home in June 2018. 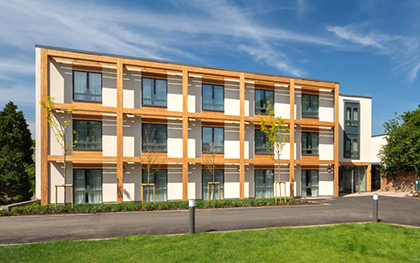 The new residential care home is just behind the original house in North Oxford and has 40 en-suite bedrooms, some of which are suitable for couples, as well as modern, spacious living accommodation with quality facilities. To register interest in attending an open day or request further details email care@fairfieldhome.co.uk. For further information visit www.fairfieldhome.co.uk. Jean Fooks, local Lib Dem councillor and current Lord Mayor, has announced that Summertown will once again have a Post Office, something she has been working on for many years. The Post Office counter will be set up in the Co-op although the manager of the Co-op warns that it will a while before the necessary re-fitting is complete. The Easy Hotel planning application will not be heard at the 13 March meeting of the West Area Planning Committee. The application can be extended past its expiry date of 31 March but if revised plans are received by the planning officer then the revised application will again be subject to the statutory consultation process. Cherwell District Council has accepted the plan to build 1,180 houses between Cutteslowe and the A34 which will lead to houses covering the greens and fairways of the venerable North Oxford Golf Club. The plan will now go to a Public Enquiry where members of the Club will oppose the scheme. Douglas Carswell, ex-Conservative and UKIP MP, will be giving a talk entitled Britain: a democracy or an oligarchy? on Thursday 15 March 2018 at 6pm at the Summertown Library. The talk considers the possibility that a new elite oligarchy is subverting our democracy and stifling our market system. Entry is free. Donations of £10 at the door to the work of the Friends will be gratefully received. Work has begun again on the refurbishmnet of 38 South Parade, the café/restaurant which will replace the Oxford Wine Café on the same site. No details are given in when the work will be completed but we look forward to seeing the transformation. South Parade, already suffering from the enforced closures of Cibo, Summertown Travel, the Yoga Garden and Bang & Olufsen by the landlord seeking to re-develop the site, is to suffer another blow when Hastings Drummond close for business on 31 March. However, further up South Parade the premises previously occupied by Paolo Gianni have a planning application for change of use to a Maths Tuition company. We can only hope they will add a colourful presence to the street.. The Summertown Neighbourhood Forum has launched a questionnaire on the future of Alexandra Park. This follows the announcement by Oxford City Council of a consultation on the current state and future of the Park. The official consultation is on the City Council website and closes on 1 March 2018. The Neighbourhood Forum questionnaire can be found by following this link . The Easy Hotel planning application will not be heard at the 21 February meeting of the West Area Planning Committee. The next WAPC meeting is on Tuesday 13 March. Police are still searching for the assailant of the 17-year-old boy who was stabbed in Middle Way on Thursday evening. The boy remains in hospital and is said to be in a serious but stable condition. The Art Department at St Edward’s School has announced a special exhibition at The North Wall Arts Centre on South Parade. The Secret Postcard Show will be open for just one day on Saturday 3 March. This exhibition gives people the chance to buy original postcard-sized artworks by pupils, art students, and emerging and acclaimed artists, illustrators and designers. The exhibition will open for viewing at 2pm. Purchase of these original works will be through a silent auction, starting at 5pm. The highest bidder on each item at 6pm will win their chosen artwork. The identity of the artists will only be revealed after bidding has closed. Funds raised by the auction will be donated to the teamArchie charity. Mark Charter, a partner at Summertown-based estate agents Carter Jonas, has warned that a combination of factors could lead to some estate agents’ offices closing over the next 12 months. His comments were made after Countrywide, a large national chain which owns brands including John D Wood, Hamptons and Taylors estate agents, issued its second profit warning in three months. North Oxford Golf Club will close if planning permission is granted to build 1,180 houses between Cutteslowe and the A34 as part of Cherwell District Council's proposals to help Oxford's unmet housing needs. Members of the club have launched a campaign to save the 110-year-old course after the Club’s management committee voted to accept a payment, reported to be £2m, from the three landlords (Oxford University, Exeter College and Merton College) not to object to plans to build homes on the land. Fairfield Residential Home on the Banbury Road is offering a number of short-term respite care rooms for elderly people at its North Oxford home. With a move to its brand new residential care home imminent, they currently have some temporary stay rooms available for immediate occupation. 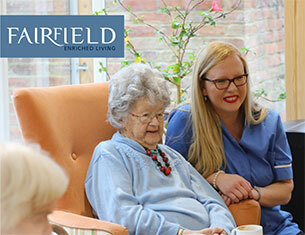 To find out more please contact care@fairfieldhome.co.uk or ring 01865 558413. St Edward’s School will be performing their regular London concert at St John’s Smith Square on Monday 5 February starting at 7.30pm. The programme features excerpts from Pictures at an Exhibition by Mussorgsky, Boehme's Trumpet Concerto with Head Boy Tom Powell the soloist, and Gloria by Karl Jenkins with Ella Davis and Head Girl Sassy Hammersley leading the choir. 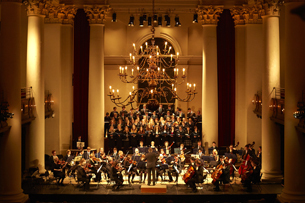 Situated in central London, St John's is considered a gem of English Baroque architecture, and a venue boasting exceptional acoustics and atmosphere. The School would be delighted if members of the local community joined them for the concert. Tickets, which are £15 (£10 concession), including a drinks reception following the concert, can be booked here. The School is also celebrating outstanding results in the EPQ, of more than 80% of candidates achieving an A*-B, and three offers of places for St Edward’s pupils from Oxford University. 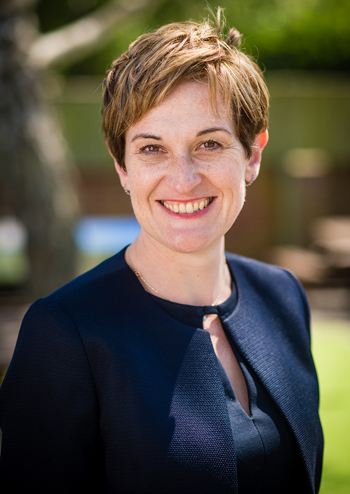 Summer Fields School has announced the appointment of Joanna Chapman as Head of its new pre-prep school, which will open its doors to boys aged 4-8 in September 2018. Ms Chapman joins Summer Fields from Knightsbridge School in London, where she has been Head of the Junior School since 2015. David Faber, Headmaster of Summer Fields, told us that “we are absolutely thrilled that Joanna will be joining us. Joanna brings a wealth of specialist experience to Summer Fields and her work ethic and child-centred approach to education are completely in line with our own”. Carphone Warehouse on the Banbury Road has closed. We had heard that a regional manager had been in the shop conducting an audit and this is no doubt the result. This is probably not unconnected to the opening of the new store in the Westgate Centre. The nearest Carphone Warehouse is currently in Cornmarket. The Oxford Wine Café on South Parade is closed for refurbshment and rebranding as No. 38 South Parade. The site was sold to new owners last year but they were allowed to continue trading under the old name while they finalised their plans. We understand that the idea of the wine café will remain but with a stronger emphasis on food. The New Year is probably a good time for thinking about wellbeing. Andrea Stanley will be running sessions of Tai Chi Qigong for Wellbeing at the United Reformed Church hall on the Banbury Road on Saturdays from 3:00-4:00 pm. The first session will be on Saturday 6 January. Andrea describes the practice of Qigong as 'a gentle flowing sequence of movement to calm the mind and relax the body'. If you would like to join the sessions please contact Andrea at floinqigong@gmail.com. The Summertown Christmas Lights will be switched on at around 5.30 on Friday 8 December outside Carter Jonas. The ceremony will be performed by the Lord Mayor. There will be music from St Edward's Brass Band and choirs from Oxford High School and Cutteslowe School from 4.45, and hot mince pies will be provided by the Co-op. This is a great family and community event. Do come along to join in the singing. There are new lights this year; this picture is in memory of the old ones. NatWest is the latest bank to announce the closure of its branch in Summertown. Following on the heels of Santander and Barclays, the branch will close on 21 June 2018. The nearest branch will be on Cornmarket. Flash in the Pan with its wide range of art, crafts, textiles and comestibles is back! It will be open on 9 & 10 December and then on 16 & 17 December from 10am to 6pm at 43 Oakthorpe Road. Do go along to find the perfect presents for Christmas. and don't forget your Flash Christmas tree from the shed down the side of Oxfam and on sale from 8-10 and 15-24 December. Email: flashtrees@gmail.com. This year's Art at Christmas collection will be at St Michael's Church Hall on Portland Road on Saturday 2 December and Sunday 3 December. It is open 10am to 5pm. This is a great place to find Christmas gifts for all your friends and family. Enjoy mulled wine, mince pies and live music while you browse the stalls. Easy Hotel has submitted a planning application for the Majestic/Wallers site (276-280 Banbury Road). It was lodged with the Council on 24 October. No emails were sent to those who had registered an interest, and the statutory notices have not be put up outside the site. These apparent flaws in the notification process should mean that the consultation period re-starts after the notices have been put up, but the consultation period is given as 14 November to 9 December. If you are interested in commenting on the application so that the views of local residents and businesses are taken into account by the planning officer and members of the planning committee, you should assume that you have to do so by 9 December. The application code is 17/02832/FUL (go to http://public.oxford.gov.uk/online-applications/ and enter that code in Search). The plans show an anodyne building, which looks like an office block, with no objectionable or redeeming features. The description reads: "Demolition and redevelopment of existing retail office, and residential premises, to provide a mixed-use scheme comprising 4 x units (use classes of either A1,A2,A3 or A4) at ground floor with a 180 bed hotel over three floors above”. If you would like to be kept informed of developments please send your name and email address to info@summertown.info. Elizabeth Jennings Way has been closed all day because of a 'chemical incident' which resulted in the hospitalization of seven police officersand seems to be related to the arrest of a man at 5.16 this morning. The man was also injured by the substance. Police and fire crews remain in attendance and a section of the is still cordoned off. 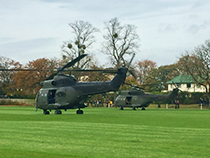 Oxfordshire’s official Poppy Appeal for 2017 was launched in the grounds of St Edward’s School last week, with two Puma helicopters delivering the first of the poppies. The Royal British Legion, various dignitaries, children from several schools and RAF service personnel watched as the helicopters arrived. 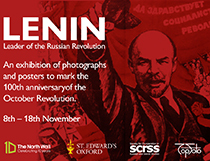 Lenin: Leader of the Russian Revolution is a new exhibition at The North Wall Arts Centre which will run from Wednesday the 8th to Saturday the 18th of November; admission is free. Opening 100 years after the Russian Revolution, this new exhibition brings together over 70 rare photographs and other material relating to the leader of the Revolution, Vladimir Ilyich Ulyanov, better known as Lenin. Drawn from the extensive archive of the British ï¿½Society for Cooperation in Russian and Soviet Studiesï¿½, most of the photographs are being shown publicly for the first time. Summer Fields School has arranged two Open House Events so that prospective parents can find out more about the new Pre-Prep, see the school's facilities and talk to members of staff. The Open House Events will be on Friday 3 November from 2-4 and on Saturday 4 November 11-1. The Pre-Prep opens in September 2018. For additional information please ring 01865 459204 or email admissions@summerfields.com. Mark Barclay Wealth Management has moved into the premises last occupied by Lifestyle on the Banbury Road. Mark Barclay Wealth Management is a representative of St. James’s Place Wealth Management, one of the leading such firms in the country, and a FTSE 100 company. “Our move into these new premises in Summertown reflects recent growth in our business,” Mark Barclay, told us, “we recognise the need for a personal, face to face relationship for financial, retirement, protection and tax planning.” The practice provides advice on a wide range of aspects, including inheritance tax, investment & retirement planning and strategic business planning, to private clients and business owners throughout Oxfordshire, the South East and the Midlands. Contact Eleanor for more information or visit their website. The Viav:be Health Gym on the Banbury Road in Summertown was formally opened this week by the TV medic, writer and broadcaster Dr Christian Jessen. While open to all, the gym is primarily targeted at the 40+ age range, and has been created specifically for those who wish to address various physical aspects of ageing and feel now is the time to find a way to become more active. 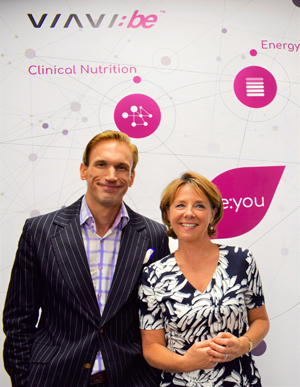 Viavi:be is the brain child of Dr Sabine Donnai (seen here with Dr Jessen), one of Harley Street’s leading medical practitioners in proactive health management and precision medicine. d’Overbroeck’s next Open Morning will be on Saturday 7 October from 10.00 to 1.00 at both the Sixth Form and Years 7-11 sites. The Sixth Form has started this term in their new purpose-built and remarkably good-looking building at 333 Banbury Road which is, by all accounts, an excellent space for studying and teaching. Years 7-11 remain at the site on Leckford Road. New Principal Emma-Kate Henry is also celebrating exceptional exam results, with 46% of A Level students achieving three or more A* or A grades. September 2017 marks 20 years since St Edward’s became fully co-educational; the school will, in the near future, have equal numbers of boys to girls. This significant anniversary is being celebrated with an exhibition at The North Wall gallery which encompasses works from seven former female art students who have gone on to establish careers as professional artists and artisans. The wide range of styles, media and techniques on display highlight the talent of the women exhibiting their work, as well as demonstrating the exceptional state of art tuition at St Edward’s in recent years. A further cause for celebration is the particularly strong exam results this year at GCSE, A Level and IB, resulting from the transformation of the academic life of the School over the last five years. Eleven pupils achieved 40 points or more at IB, including one who received full marks; a feat achieved by fewer than 1% of candidates worldwide. This was matched at A Level where almost half of all grades were A*/A. 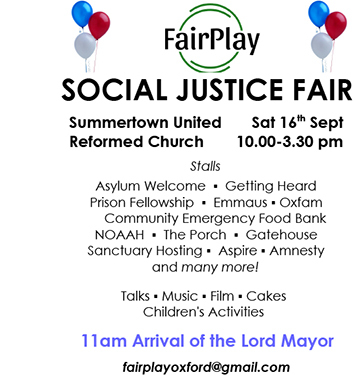 Fairplay is holding a Social Justice Fair at the United Reformed Church on the Banbury Road in Summertown on Saturday 16 September from 10.00 to 3.30. There will be lots of stalls from organisations working to acheive social justice and lots of activities for all the family. Oxford High School and d’Overbroeck’s have joined forces with three other Oxford schools to form the Oxford Schools’ Bus Partnership. This will make it easier and safer for children to travel to school by bus and will also reduce traffic congestion in Summertown. They have announced a network of nine routes around the county that will operate from September 2017, serving all five schools. This map shows the routes: OSBP-2017-Busmap. To book your child’s seat, fill out and email this form: OSBP Booking Form 2017-18_26052017 to the OSBP Transport Co-ordinator on info@osbp.net. This year’s GCSE results at Oxford high School show the highest number of A*s at GCSE that the school has ever achieved. Over 75% of grades were A*. More than half of the year group achieved at least 9 A* grades. 30% of girls achieved straight A*s. 94% gained A*-A grades.This is a remarkable achievement for the Year 11 girls and for the school. Summer Fields School has announced plans to provide more places and greater accessibility for local boys. In September 2018 a new Summer Fields Pre-Prep, housed in a purpose-built extension and offering facilities for 80 boys aged four to eight, will open its doors to Reception, Year 2, and Year 3 boys, providing places for boys joining at ages four, five and seven. The existing prep school will also be expanding, offering additional places for eight year-olds wishing to join the school in Year 4. A Year 1 class will be introduced in the pre-prep in 2019. These changes will make the school even more accessible to boys from a range of backgrounds as the school will also be offering an increased number of bursaries to boys seeking day or boarding places in the prep school from September 2018. Headmaster, David Faber, commented “We are now enabling boys to benefit from a Summer Fields education from the very start of their schooling”. Commuters and residents are facing long delays as a result of the resurfacing of Sunderland Aveneue. This comes on top of recently released figures showing that journey times have increased on many routes, including Woodstock Road, Banbury Road, Sunderland Avenue and parts of the A40, following the £10 million scheme to improve traffic flows on the Wolvercote and Cutteslowe roundabouts. These improvements were meant to be future proof so as to to deal with the increased traffic resulting from the planned new housing developments in the area. Health food shop Revital is now open for business on the Banbury Road selling a wide selection of high quality supplements, health foods and natural beauty products. Home-Start Oxford – a voluntary organisation committed to promoting the welfare of families with at least one child under 5 – is currently seeking volunteers interested in providing practical and emotional support for parents. Volunteers generally commit to visiting for 2-4 hours per week. No special qualifications are necessary and full training and support are provided. If you are interested in volunteering, their next course will start on 18 September. Contact Home-Start on 01865 779991 or admin@homestart-oxford.org.uk. 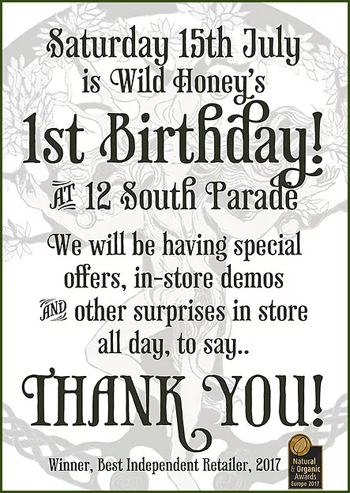 Wild Honey are celebrating their 1st Birthday at 12 South Parade, on Saturday, 15 July. Between 9am and 6pm on the day, they will have lots of tasters, freebies, special offers, goody bags and demonstrations from some of their favourite suppliers, so do go along and celebrate with them. During what owner Matt Sage describes as ‘an exciting, hard-working and also hugely fun 12 months for all of us in Summertown’ he says ‘it has been wonderful to meet so many new customers and friends over the course of the past year’ and thanks everyone for their 'support, encouragement, feedback and custom'. During July and August, Tesco has chosen The Friends of Summertown Library as one of three Oxford community projects it is supporting in its local stores, via the 5p bag levy. Remember to ask for a token at the till in any local Tesco store, and place it in the right-hand column of the nearby stand (you don’t have to buy a bag). This could gain the Friends £4,000 towards its target of £85,000. The Oxford Wine Café, beloved of so many Summertown residents, has new owners. Previous owner, Ted Sandbach of the Oxford Wine Company, tells us that the sale was prompted by a "huge rent increase and 87% rates rise". The new owners will continue to offer wine from the Oxford Wine Company but will increase the emphasis on food. With such excessive rents and business rates it si no wonder that there are still so many empty shops in Summertown. A reminder that the North Oxford Association is holding an Open Day on Saturday 15 July from 12 to 4. Local residents will have the opportunity to try out some of NOA's regular activities and to find out how to get involved with our local community centre and association. There will be Arts activites, Children’s craft, Dance demonstrations, a Raffle, a Cake sale, and more. There will also be free taster sessions of regular classes such as Monkey Music, Calligraphy, Zumba and Dance Aerobics. To find out more and to book sessions please email Sarah or call 01865 552295. Emma-Kate Henry took over as Principal of d’Overbroeck’s school on 1 July,. 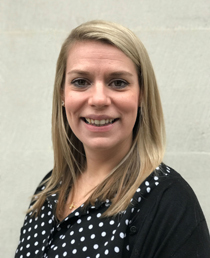 Previously Head at a 2-18 years co-educational independent school in Hampshire, Emma-Kate has spent the Summer term at d’Overbroeck’s working alongside the outgoing Principal Sami Cohen who retires after 21 years in the role. These are exciting times for the school. 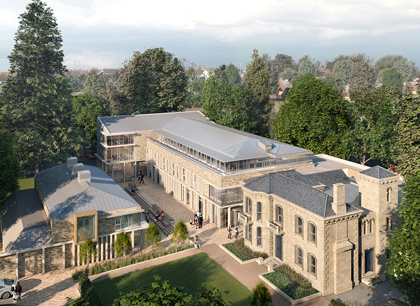 The Sixth Form is moving to a new site at 333 Banbury Road over the summer and a new boarding house, Islip House, is opening just opposite the new Sixth Form site. The Hall at the new Sixth Form site is to be named The Cohen Hall to mark Sami Cohen’s contribution to the school. There will be an opportunity for the public to look around the new teaching buildings as part of Oxford Open Doors on Saturday 9 September as well as during the school’s next Open Day on Saturday 7 October. OnSalsa have a Salsa Beginners Course starting today. Click this link for full details. The Majestic and Knight Frank building (see below) is to be replaced with a "super-budget" Easy Hotel, according to chief executive Guy Parsons. The 180-bedroom hotel will form part of a mixed-use development, taking up the first and second floors of the property. A 25-year lease has apparently already been granted to Easyhotel PLC, and a contract signed with 4Urban Consulting to build the hotel which will open in 2019. There will be no car parking provided. Despite the fact that no planning application has yet been submitted, Easyhotel are obviously confident that planning permission will be granted. We can think of little that Summertown needs less than a super-budget hotel. There is already significant over-capacity at all price points (Jurys Inn, Holiday Inn, Travelodge, Galaxie Hotel, Cotswold Lodge Hotel, Linton Lodge Hotel, Old Parsonage Hotel, numerous smaller hotels and B&Bs, and a lot of AirBnB accomodation) for visitors to the north Oxford area. With no car parking, the impact on Summertown's very limited non-residential spaces and small carparks will be significant, and is likely to lead to a reduction in shoppers who are already put off by difficulties over parking. As budget hotels are known to spawn budget eateries, such as MacDonalds, KFC and Burger King, there will undoubtably also be pressure on the Council to increase the allocation of restaurant use in Summertown. If you would like to be kept informed about this development please email us. This is a reminder that Cancer Research UK is encouraging people to get together and enter Relay For Life, a unique celebration of life and hope which unites communities to help beat over 200 types of cancer. Teams of between eight to 15 people, of all ages, levels of fitness and from all walks of life are needed to take part at Oxford Harlequins Rugby Club on the Marston Ferry Road, Summertown over the weekend of 1-2 July. Participants are asked to raise as much money as possible in the months leading up to the Relay through fundraising activities and donations from friends, families and work colleagues. During the Relay, team members take it in turns to walk round a track while everyone else enjoys a wide range of fun activities. As Relay For Life is non-stop through the night, those team members not on the track can take turns to rest, eat, or sleep in their tents which are set up close by. For more information visit the website, email relayforlifeoxford@gmail.com or ring Event Chair, Jacquii John, on 07990 037164. We hear that plans to demolish and redevelop the old North Oxford Garage site, currently occupied by Majestic and Knight Frank, are at an advanced stage. The landlords are perhaps overkeen to see the departure of the two businesses even though their lease has a year to run. Cherwell Boat House is hosting the renowned Opera Anywhere for a unique performance of opera on punts on Sunday 18 June at 5:00pm. After an opening show at the Boathouse, they will punt & sing their way upstream to the Victoria Arms, arriving around 6:00pm for some refreshments and more Opera, before making their merry way back to the Boathouse. Everyone is welcome to come along and enjoy the spectacle. You can relax with a Pimms at the Boathouse or take a punt (£18 per hour; no booking needed) and follow the opera along the river. Portabello is hosting a seven-course Galicia & Catalunya Spanish Tasting Dinner on Thursday 29 June. The wines have been chosen by Jake Osbourne from Bibendum who will be talking about the selection. The meal costs £40 and you can ring 01865 559653 to book your place. Wild Honey is hosting a demonstration by Aston's Master Baker, Syd Aston, of all things baked & organic on Saturday 10 June from 10:00-18:00 at 12 South Parade. This will be a great chance to find out more about the delicious bread sold at Wild Honey. The North Oxford Association is holding an Open Day on Saturday 15 July from 12 to 4. Local residents will have the opportunity to try out some of NOA's regular activities and to find out how to get involved with our local community centre and association. There will be Arts activites, Children’s craft, Dance demonstrations, a Raffle, a Cake sale, and more. There will also be free taster sessions of regular classes such as Monkey Music, Calligraphy, Zumba and Dance Aerobics. To find out more and to book sessions please email Sarah at development.noa@gmail.com or call 01865 552295. 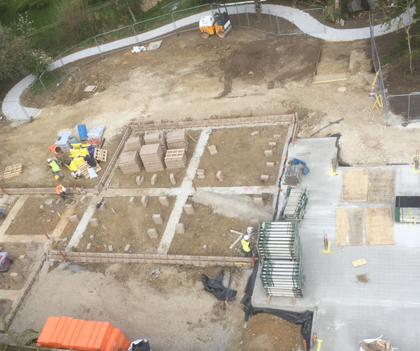 Construction is underway on a major building project in North Oxford that will see a care home for the elderly constructed next to student accommodation. 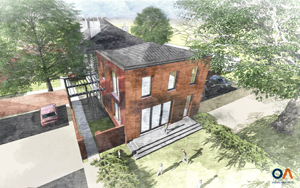 The new Fairfield residential home will share garden space with graduate students at University College, allowing for interaction between the residents of both institutions. Located on the Banbury Road and designed by Oxford Architects, the new home will accommodate 38 residents in en-suite rooms. There will be a range of communal areas and recreational rooms that have been designed to be light and airy, with views over the mature gardens. 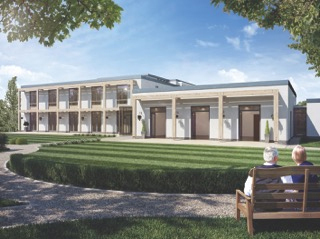 The new Fairfield residential home is expected to open in mid-2018. Once the new home is open, Univ will convert the existing Victorian building into graduate student accommodation. Margaret MacMillan, Professor of International History and Warden of St Antony's College, will be giving a talk on Thursday 15 June 2017 at 6pm at the Summertown Library. The talk considers how, a century after the First World War, we are still coming to terms with what that prolonged conflict meant for European society and the wider world. Entry is free. Donations of £10 at the door to the work of the Friends will be gratefully received. Oxford City Council's latest draft Local Plan contains a proposal which will affect two developments in Summertown. A change to key worker housing rules would make it easier for Oxford’s two universities, the NHS, schools and bus companies to build accommodation for staff and students on their own land, exempting them from social housing requirements. Oxford University’s pro vice-chancellor for planning, Professor William James, said that this potentially cleared the way for several schemes including the redevelopment of Diamond Place in Summertown. There are also proposals to curb a rise in 'speculative' student accommodation developments that are not backed by either of Oxford's universities which will, we hope, reduce the likelihood of the fine buildings in South Parade being demolished to make way for student flats [see news item 21 Jan 2016]. The draft Plan does also, however, recommend that restrictions on building heights in Summertown be relaxed to increase the density of developments. The shop recently vacated by Moda in Pele at 229 Banbury Road is being taken by health store Revital. A regional chain with 14 other stores they sell vitamins & supplements, healthy food and drink, and other aids to a healthy lifestyle. With Wild Honey, Holland & Barrett, Boots, and two Rowland pharmacies Summertown is rapidly becoming a centre for healthy living. Brainomix, based in Suffolk House on the Banbury Road, will be able to offer its treatment for stroke victims to many more people after being chosen for a major European project. Its medical imaging software e-ASPECTS, which automatically assesses CT scans to gauge how badly the brain has been damaged, has been selected for the Angels Initiative, which plans to improve stroke care by opening 1,500 specialist centres around Europe. We learn that d’Overbroeck’s new Sixth Form complex at 333 Banbury Road is nearing completion. Staff will move in over the summer holidays and the building will open at the beginning of September. The school is also welcoming a new Principal, Emma-Kate Henry, who is spending the summer term getting to know students and staff, and tells us that the new developments ‘will provide first class facilities to add another dimension to a d’Overbroeck’s education. This is a very exciting time in the school’s development and the new Sixth Form buildings are just a part of this.' Work has also been proceeding across the road at number 376, where an additional boarding house for Sixth Form students is almost completed. The school’s next Open Days are on Saturday 7 October; at Leckford Road for entry at year 7 or 9, and at 333 Banbury Road for direct entry to the Sixth Form. There will also be a Sixth Form Open Evening on Tuesday 14 November. Sixth Form Scholarship Exams are held in November. For more information and to arrange a visit, contact Mrs Lynne Berry on 01865 310000 or see more details here. Dr Antony Richards, chairman of the Inspector Morse Society, has proposed that a statue of Colin Dexter, Summertown resident and author of 13 Morse novels who died recently, be placed in Summertown. Sculptor Alex Wenham has volunteered to create the statue and it has been suggested that it could be situated in a piazza in the proposed Diamond Place redevelopment. It is possible that work will start on the redevelopment in 2020 so we may have to wait a while before we can enjoy the statue of one of Summertown's most famous residents. COOK has been going for 20 years (5½ years in Summertown), and to celebrate the anniversary they are giving all of their customers 15% off everything in the shop on Saturday 20 May, and 15% off everything via click and collect all weekend. Go instore or online to take advantage of this great offer. This year's Summertown Artweek begins on Saturday 20 May. Artweeks gives you the chance to visit artists in houses, studios, workshops, exhibition spaces, shops, galleries and churches in Summertown. You can talk about their artwork and their creative lives, and buy their work if you wish to. There is so much to see – painting, drawing, photography, printmaking, ceramics, jewellery, silversmithing, glass, woodturning, sculpture, and much more. Pick up a Summertown brochure at the Library or one of the local shops, or go online to see the full Artweeks guide. Come along on Saturday morning to listen to Jazz outside The Dewdrop. There will be a Funk band and a French Jazz band playing from 10:30 to 13:00. 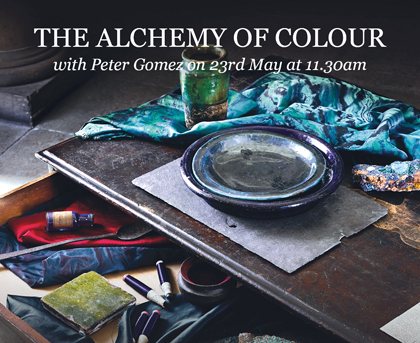 Peter Gomes, head of the Zoffany creative design studio, will be giving a talk about The Alchemy of Colour at The Curtain Shop on Tuesday 23 May at 11.30. It promises to be a fascinating talk and there will also be a preview of their new paint and wallpaper collections. Ring 01865 553405 for more details and to reserve a place. St Edward’s School (Teddies) has taken delivery of 40,000 new inhabitants of its grounds. Housed in four new purpose-built hives – made by pupils Afiq Rozhan, Guy Moss, Nikita Radkevitch and Gurinder Singh – the School is now home to honey bees for the first time. 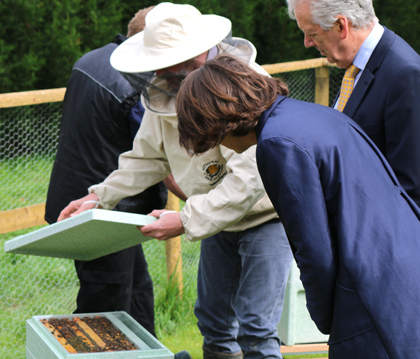 An apiary has been established in the School’s grounds next to the Oxford Canal. David Aldred, the teacher in charge of the project, and the pupils in the Bee Team expect the honey collected from the hives to be used by the School’s catering department, with additional produce being sold. A new Beekeeping Society will shortly be set up at the School to teach and promote the ancient art of beekeeping. A competition will also be launched for pupils to design the new Teddies Honey labels. Cancer Research UK is encouraging people to get together and enter Relay For Life, a unique celebration of life and hope which unites communities to help beat over 200 types of cancer. Teams of between eight to 15 people, of all ages, levels of fitness and from all walks of life are needed to take part at Oxford Harlequins Rugby Club on the Marston Ferry Road, Summertown over the weekend of 1-2 July. Participants are asked to raise as much money as possible in the months leading up to the Relay through fundraising activities and donations from friends, families and work colleagues. During the Relay, team members take it in turns to walk round a track while everyone else enjoys a wide range of fun activities. As Relay For Life is non-stop through the night, those team members not on the track can take turns to rest, eat, or sleep in their tents which are set up close by. For more information visit the website or ring 0871 641 2602. The 10th Young Art Oxford children's art exhibition will take place at the Ashmolean Museum on 4, 5 and 6 May. The theme this year is 'The World We Live In' and the organisers tell us that the exhibits are "thought-provoking and exciting". 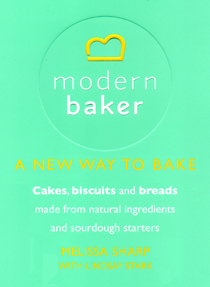 The recently launched Modern Baker cookery book, entitled A New Way to Bake, is a well-designed and clearly-wriiten guide to help you make delicious cakes, biscuits and breads using natural ingredients and sourdough starters.Copies are available from Modern Baker and all good bookshops. Having recently lamented the number of emply shops in Summertown we are delighted to see that three are showing signs that they may be occupied again. The shop last occupied by Moda in Pele is under offer, the one recently vacated by Lifestyle has Let signs in the window, and a licence to sell alcohol has appeared on the door of what was the Paolo Giani salon. Tutorious, a new tutorial agency specialising in A-level tuition, has opened at 35b South Parade (entrance from Stratfield Road). They can be contacted on 01865 604545, 07719 108957 or enquiries@tutorious.co.uk. The Lifestyle shop on the Banbury Road has closed suddenly and without any notice. This could be a further sign of more difficult trading conditions and could also be linked to the imminent rise in business rates. There are now more empty retail properties in Summertown than at any any time for at least the past 15 years. Some of those properties, in South Parade, are only empty because the landlord refused to renew leases to the existing businesses as we reported on 21 January and 10 May 2016 (see below). Last week the property once occupied by Cibo! was occupied by squatters who evidently felt that such a fine building should not be left empty. The landlord, whose business is registered in Panama, is taking legal action to get them to leave. Summertown traders are becoming concerned about a group of children who have been going round the Summertown shops presenting fake £20 notes. They buy small items and distract the person on the till with lots of questions while waiting for change. The police have been informed and any suspicious activity should be reported to them. Nuffield Health is the latest business to run the leisure centre in the grounds of St Edward’s School, off the Woodstock Road. The Oxfordshire Health & Racquet’s Club which opened recently “has it all”, in the words of Deputy Manager Brian Quinn, “Our members can play tennis, squash or badminton, take a dip in the indoor or outdoor pools, work out in the fully-equipped gym or join friends in one of our wide range of group exercise classes. There’s also a spa, sauna and steam room to help members unwind, and the crèche, café and free parking make it easy to stay fit as a family, or find time for yourself”, continues Mr Quinn. Membership starts with a complimentary Health MOT, helping the Club’s staff to create a tailored fitness plan for each member. The Club is offering a free one day trial. Ring 01865 318300 to book your free trial, or visit their website for more information. Celebrate Mother’s Day on Sunday 26 March with lunch at The Cotswold Lodge Hotel. Book now on 01865 512121 – 2 Courses for £20.00 or 3 Courses for £25.00. The Cherwell Boat House is hosting a Comtes Lafon Tasting Dinner on Thursday 30 March at 7.30pm. Six delicious courses will be accompanied by very special matching wines from one of Burgundy's most famous producers. The dinner costs £118. Ring 01865 552746 to book. Sir Adam Roberts, Emeritus Professor of International Relations at Oxford University, will be giving a talk entitled In the Age of Brexit and Trump: a new international order? on Thursday 16 March 2017 at 6pm at the Summertown Library. He will explore key questions about these events. What caused them? What are their consequences for the EU and the rest of the world? Are they part of a wider resurgence of nationalism? Are we now in a ‘post-truth’ world? Is there now a need to re-think liberal ideas about politics? Entry is free. Donations of £10 at the door to the work of the Friends gratefully received. The England Senior Men’s Rugby squad set up camp at St Edward's School ahead of their Six Nations clash with Scotland on 11 March. Their three day training camp afforded the pupils and others the chance to observe some of their training sessions as their England idols were put through their paces on the School’s playing fields. Pupils of all ages were able to pick up hints and training tips from the sessions, coming away inspired to strive even harder in their endeavours towards their sporting and wider goals. 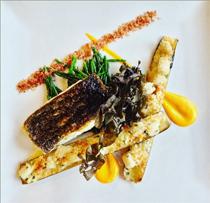 Following on from the success of their last tasting dinner, the Cherwell Boat House is hosting a Seafood Tasting Dinner on Thursday 23 February at 7.30pm. Six courses will be accompanied by matching wines. The dinner costs £68. Rring 01865 552746 to book. 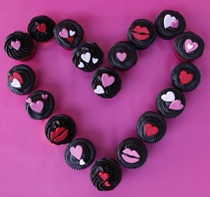 Julia at Happy Cakes is offering a gift box of 12 buttercream topped cupcakes with handcut Valentine toppers for £30 inc. delivery within Oxford on Tuesday 14 February. To order email julia@happy-cakes.co.uk or call 07814 519611. An exhibition of rarely-seen photographs by film director Ken Russell, of Teddy Girls and Boys taken in the 1950s, has gone on display at The North Wall Arts Centre, South Parade. The exhibition, containing 50 pieces by Ken Russell, seen here together for the first time, is open to the public until Saturday 18 February. 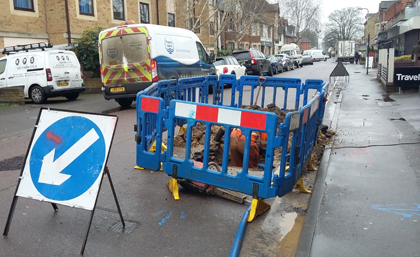 The leaking water main outside A Cut Above in South Parade has finally be sealed, although the hole may not be filled in for another two days. 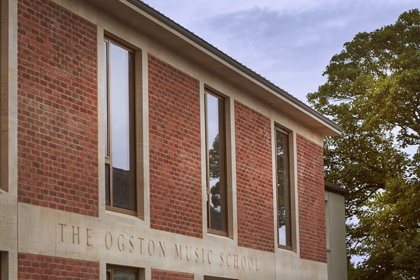 St Edward's School has opened the doors of its new Ogston Music School in South Parade. The brand new development provides the School with a magnificent new recital and rehearsal space able to seat up to 120 people. The new facility also features 20 practice rooms; seven ensemble rooms; a recording studio and rock room; and a new Sixth Form Music Library. The new Music School has ambitious plans to establish itself at the heart of the local community, welcoming schools, touring musicians and community performances. The Summertown Neighbourhood Forum has produced a Plan which will influence all future local development in Summertown and St Margarets. The proposals in the Plan, once put into effect, will have a significant effect on our community. Please visit www.summertownstmargaretsforum.org.uk to comment on the proposals and also to add any ideas you would like to see incorparated into the Plan. The closing date is Sunday 26 February 2017. The Friends of Summertown Library have arranged a talk by Sir Muir Gray, CBE, MD on The NHS in 2017 - and beyond. The talk is on Thursday, 2 February from 6 - 7 pm in Summertown Library. Entry is free but donations of £10 on the door to help the work of the Friends will be gratefully received. The Friends report that 2016 was the best ever year for fundraising and they hope to reach their initial target by the end of 2017. Then the re-modelling of Summertown Library can begin. Following on from the success of their last tasting dinner, the Cherwell Boat House is hosting a Rhône Valley Tasting Dinner on Thursday 26 January at 7.30pm. Six courses will be accompanied by matching wines. The dinner costs £68. Click here for the menu, or ring 01865 552746 to book. You can also take advantage of these exclusive great Winter Offers. On Monday 19 December lunch and dinner, Tuesday 20 December for lunch or Wednesday 21 December for dinner, the Cherwell Boathouse restaurant is offering three courses with a glass of sparkling wine and a glass of recommended wine per course for £35.00 per head. You can also have two courses and a glass of sparkling for £20.00 or three courses with complimentary cheese & port for £29.75. Christmas trees are now on sale at 223a Banbury Road (down the side of Oxfam). These trees are very good quality and are highly recommended. A donation will be made to local charity Asylum Welcome for every tree sold. You can contact Flash Christmas Trees on 07846633957, flashtrees@gmail.com and Flash Christmas Trees on Facebook. New hairdressing salon, Bei Cappelli, has opened next to Canelle Beauty in Oakthorpe Road. They are offering new customers a 15% promotional discount until 31 January 2017. The Summertown Christmas lights will be switched on at 5.00 pm on Friday 9 December by the Christmas tree outside Savills. A brass band from St Edward's School will play carols, and the choir from Cutteslowe school will sing seasonal songs, before the Lord Mayor begins the count-down to the switch-on. Do come along and enjoy the music, the atmosphere and the mince pies kindly donated by the Co-op. Stylists from Paolo Gianni, which closed in October, are opening a new salon in South Parade. The salon, Pankhurst & Deane, which is opposite Renaissance Beauty will be run by Emma Pankhurst and her business partner. As Emma told us, ‘we started looking for premises and found the most beautiful shop at 34 South Parade. We hope to be up and running by 3 December and all of the staff from the old salon are relocating with us’. Cherwell Boat House is hosting a Tasting Dinner on Thursday 24 November at 8.00 for 8.15pm. Six courses will be accompanied by matching wines from France and Italy, with guests being presented with score cards to determine which country has the best wine. The dinner costs £75. Click here for the menu, or ring 01865 552746 to book. We learn that the premises in Oakthorpe Road, once occupied by Accent, will soon be occupied by another hairdresser. We are told that they plan to open in December. Mamma Mia Pizzeria, has gained a Platinum Award and been named the UK’s ‘Best Independent Pizza Restaurant’ at the Pizza, Pasta & Italian Food Association (PAPA) Awards 2016. The judges said,“To be considered the best pizzeria in the country takes a combination of brilliant food, great service and ambience. Mamma Mia delivers on all levels and offers a truly great pizza experience”. Following on from the success of their last tasting dinner, the Cherwell Boat House is hosting a Game Tasting Dinner on Thursday 27 October at 7.30pm. Six courses of game dishes will be accompanied by matching wines from Germany, England, France and Portugal. The dinner costs £75. Click here for the menu, or ring 01865 552746 to book. In another surprising and sudden closure, Moda in Pele (the fashion shoeshop on the Banbury Road) has shut up shop and removed all the stock. Oxfordshire hairdressing group Idlewild has opened at 263 Banbury Road in Summertown. This is Idlewild’s fourth salon. The Banbury Road salon will boast a seven-strong team of experienced stylists. As well as the latest professional cutting, colouring and styling services, Idlewild also offers haircare products, including Kerastase and L’Oreal Professionnel Tec Ni Art, and eco-friendly Aveda. Book your appointment now on 01865 511551 and discover what makes Idlewild special. Paolo Gianni, the hairdressers on South Parade, has closed overnight. There is simply a notice on the door thanking customers, saying the salon is now closed and giving contact details for the stylists. Cherwell Boat House is holding a Riesling Tasting Dinner at 7.30 on Thursday 6 October. Six courses of delicious food will be accompanied by matching wines from the wide range produced in the region. The dinner costs £68. Click here for the menu, and ring 01865 552746 to book. Julia Atkinson of Happy Cakes caused quite a stir on the set of Endeavour in Oxford when she presented the stars of the TV show, Roger Allam and Shaun Evans, with a large sponge cake topped with miniatures of the pair. Julia has taken cup cakes for the cast and crew in the past, but decided to do something different for last episode in the current series. Wild Honey are holding an opening celebration at their organic health store at 12 South Parade on Thursday 8 September. This will be a chance to meet local organic producers, get free nutritional consultations, and explore the ever-widening range of products for sale. Author Harry Sidebottom will be discussing his Throne of Caesar series at Summertown Library Saturday 3 September at 11:00-12:00. The Throne of the Caesars series is set in third century Rome; a dramatic era of murder, coup, counter-rebellions and civil war. Filled with intrigue, betrayal and bloody battle, Fire & Sword, the latest and final part of the trilogy, creates a magnificent world built on brutality and political games, where no one is safe from retribution – not even those who dare to rule. Tickets for the event are free but limited, please contact the library directly on 01865 558290 or email the library. Home-Start Oxford – a voluntary organisation committed to promoting the welfare of families with at least one child under 5 – is currently seeking volunteers interested in providing practical and emotional support for parents. Volunteers generally commit to visiting for 2-4 hours per week. No special qualifications are necessary and full training and support are provided. If you are interested in volunteering, their next course will start in late September. Contact Home-Start on 01865 779991 or admin@homestart-oxford.org.uk. The celebration of the 35th Anniversary of Mamma Mia culminates in a prize draw this Saturday 25 June. Owner Jon Ellse says, “Thank you so much for all your support. If you live near South Parade and have a moment to pop in, we would love to raise a glass of Prosecco with you and share a slice of pizza”. Organic health store Wild Honey plan to open their new Summertown shop at 12 South Parade on Monday 11 July. Jessica Howy tells us that "the shop will be open 7 days a week. We will be replicating the Wild Honey store in East Oxford and we are very much looking forward to being in Summertown". They will be selling much of the same local, organic and ethical produce that they currently stock in Magdalen Road are "looking forward to meeting many new friends and customers in sunny North Oxford". It is likely that Liscious will be closing their shop on South Parade on Saturday 11 June. Fran is planning to run a pop-up Liscious shop once a month at her shed behind Oxfam. Watch this space for more details. The South Parade shop is being taken over by organic health store Wild Honey who currently run a destination store on Magdalen Road. Portabello is hosting an Italian evening on Friday 8 July with a delicious set meal complemented by a selection of wines from award-winning Italian maker Bastianich. Full details of the evening and the menu are here. "I have some friends in Summertown who introduced me to the area and I was immediately bowled over by the sense of community. Local businesses and residents have welcomed us with open arms and our neighbours have really helped fill us in on the local area. "Bread is the core of our GAIL’s story and we make sure it’s at the heart of our customer experience in our shops. The design of the bakery in Summertown centres on abundant displays of our loaves and the rest of our sweet and savoury goodies, so our customers can be tempted by the little creations our bakers have come up with that day. We like to let the beauty of the food speak for itself and keep the interior design simple. "It’s always been part of our dream to open a bakery in a neighbourhood outside of London and we’re grateful that Summertown has received us so warmly, so far." For our part we can say that GAIL's is a very welcome addition to our high street. The Bang & Olufsen shop on South Parade has closed, having received one month's notice to quit from the landlord. They will continue to offer care and servicing to their existing customers and hope to set up in new premises in Summertown if a suitable site becomes available. This is a sad day for Summertown as there has been an audio business in that shop since Edwin Horn and his son Cecil started selling Isis wireless sets from the premises in 1923. It was, until yesterday, the oldest audio retailer in the country. The current landlords are decendents of Horn & Son. This move is thought to be linked to the desire of the landlord of the Co-op building to replace both these buildings with a block of student flats (see 21 January 2016 below). We hear that the Twinings building, latterly occupied by Barefoot Books, is going to be leased to Breckon & Breckon estate agents. We understand that they will be amalgamating their City and Headington offices into their new Summertown premises. Liscious Interiors, who have been trading from various addresses in Summertown for many years are finally closing their shop at 12 South Parade. Fran's collection of attractive, colourful and unusual objects has provided a welcome visual focus in Summertown. Following the departure of Barclays, Santander is the latest bank to announce that they will be leaving Summertown. The branch will close on 11 August.. Finally, we have heard unconfirmed reports that the building vacated by Barclays is to be taken over by Waitrose for conversion into a Little Waitrose store. There have been many rumours of Waitrose's arrival in Summertown over the years; it will be interesting to see if this one is correct. Oliver Bonas has launched their Holiday collection. "Fusing festival bohemianism and graphic tribal textures with the relaxed feel of a sun-kissed afternoon at Coachella, Holiday at Oliver Bonas is both spirited and refined in the same stroke". Click this link to see more. The Dewdrop Inn reopened today following it's refurbishment. Now owned by Mitchell & Butler, the pub will be offering different promotions each day of the week. We hear that ZAKTI have had a very busy first few days of trading in their new shop in Summertown – the first store they have opened outside London. Following the launch of an activewear range for men just days before they opened, they are selling sportswear and activewear for both men and women. Rowan Waller of Summertown-based Wallers of Oxford has won one of six 'Highly Commended People' Awards in the annual Estate Agent Of The Year Awards. The choice of winners is based entirely on feedback received from the agent's own clients, so winning this national award is a signal achievement. Rowan was presented with the award by TV's Phil Spencer at a ceremony at the Grosvenor House Hotel on Park Lane. Women's activewear brand, ZAKTI, will be opening its doors at 231 Banbury Road on Saturday 30 April. Brand manager, Jon Franklin, tells us that the brand provides 'new ranges of clothing for yoga, gym, ski, dance, swimming and cycling using carefully chosen performance fabrics that will allow you to look as good as you feel'. Artists and craftspeople all over Summertown, Wolvercote and Wytham are putting the finishing touches to their work before mounting their exhibitions ready for the launch of Summertown's Artweek on Saturday 7 May. There will be information and brochures, and two jazz bands, at the Farmers Market on Sunday 8 May, and you can get a preview of the art that will be on offer by clicking this link (5mb pdf file). Mamma Mia, the much-loved pizzeria on South Parade is celebrating its 35th Anniversary (or Anniversario) this year. The Anniversary coincides with Mamma Mia featuring on Trip Advisor as one of the UK's top 20 pizzerias, as well as being named the Best Italian Restaurant in the south of England at the Food Awards. As owner Jon Ellse says, 'In the restaurant world 35 years is a very long time indeed. Over the years we’ve kept to an authentic pizza style and taste – the best and freshest ingredients need little intervention. It’s a pleasure to see customers who were regulars in the 80s bringing along their own children and continuing to enjoy Mamma Mia as a family restaurant'. The celebrations will run from April to June, culminating in an Anniversary Prize Draw for customers. Prizes will include a weekend trip for two to Florence to stay in a 5 star hotel, tickets to see Italy play England in the 2017 Six Nations, school fund raising vouchers, cases of Italian wine from the Mamma Mia list and lots of complimentary meals at Mamma Mia. Click this link for more information on the prizes and how to enter. Work has begun on renovating and fitting out the old Cargo shop on the Banbury Road as a ZaktiActive store selling a women's sportswear brand called Zakti which includes gym, cycling and yoga wear. At the same time, the Dewdrop pub on the opposite side of the road is having an extensive makeover and re-branding with a complete internal and external refurbishment. The pub is expected to reopen on 4 May. Further up the Banbury Road the old Masonic Lodge at 333 is being transformed into a new sixth form centre for d'Overbroeck's school. As well as teaching rooms the centre will include five laboratories, suites for art, music and drama, and communal and recreational space. Join a French group with a difference. 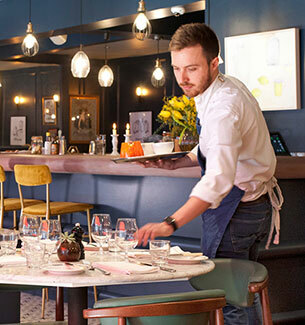 Speak French in the convivial atmosphere of the Oxford Wine Café. The group is for all francophiles interested in discussing topical issues in France and other francophone countries, while sampling fine French wines and learning about them from the experts. Native speakers and anyone who wishes to improve their French are very welcome. The group will meet once a month on Wednesdays from 18:00-19:30. The first dates are: 6 April, 4 May, 1 June and 6 July. There is no need to book, just turn up for the first meeting. A reminder of the fashion show being held at St Michael & All Angels Church in Lonsdale Road on Saturday 19 March. Designer wear from smart casual to wedding day frocks will be being modelled, and there will be an auction and a raffle with amazing prizes. Doors open at 7pm. Tickets cost £5 and are available by ringing Leah Mattinson on 01865 311762 / 07745130956 or emailing this address. More than 40 firefighters were called to a suspected arson attack on the unoccupied former care home at the junction of Banbury Road and Hernes Road on Saturday night. Six fire engines plus incident command units from Eynsham and Woodstock and a cherry-picker were sent to the scene. Firefighters wearing breathing apparatus searched the property but did not find anyone inside. An investigation was continuing this morning into the cause of the care home fire. Wallers of Oxford have been shortlisted for ‘Best Estate Agent for the Southern Region’ in the national Estate & Letting Agent Awards. The award scheme, known as the ESTAS, measures the quality of customer service provided by agents. The awards ceremony is at the Grosvenor Hotel in London and is being hosted by TV Property Expert, Phil Spencer. St Michael & All Angels Church in Lonsdale Road is holding a fashion show on Saturday 19 March. Doors open at 7pm. Tickets cost £5 and are available by ringing 01865 311762 / 07745130956 or emailing this address. Gail's Bakery will be opening its doors at 251 Banbury Road on Thursday 18 February. The bakery’s beautiful displays will be made up with loaves including Gail’s French Dark Sourdough, Mixed Olive Sourdough, Quinoa Sourdough and Honey & Almond Sourdough. The bakery also specialises in morning pastries, yogurt pots and toast. A hot brunch menu will be served until 3pm, offering eggs, French Toast, shakshuka and more. Lunch includes seasonal soups, sandwiches and salads, as well as quiches and sausage and vegetarian rolls. Cakes will be served all day, with afternoon tea bakes including brioches and delicate cakes. There is a parking space for one car available to rent in Portland Road. Please let us know either via our contact page or email if you are interested, and we will pass your details on to the householder. This has now been taken. St Edward’s Orchestral Concert will take place on Sunday 31 January at 8pm in St Michael’s Church, Lonsdale Road featuring a formal programme of popular classical music performed by the Symphony Orchestra: Rossini’s Overture to The Barber of Seville, Haydn’s beautiful Trumpet Concerto (Tom Powell, trumpet soloist) and Schubert’s Symphony no 8 ‘Unfinished’. Entry is free and there are no tickets. Cibo!, the much loved Italian restaurant on South Parade, is being forced to close after 15 years in Summertown. The landlord has exercised his right not to renew the lease, on the basis of wanting to re-develop the site. We learn that he proposes to demolish the fine Victorian building and replace it with a block of student accomodation. It is possible that the Georgian house next to it is also under threat. Cargo on the Banbury Road is to close by the end of March, at the latest, but may close earlier if all stock is sold. Various Cargo stores across the south east are being closed by owner Steinhoff UK, while others are being re-branded as Bensons for Beds. We learn that the shop recently vacated by Johnson's Cleaners at 251 Banbury Road is being fitted out to be a Gail's Bakery. This chain of artisan bakeries has a large presence in London. Christmas trees are now on sale at 223a Banbury Road (down the side of Oxfam) and from 5 December outside the pop-up Flash in the Pan shop in the Studio at Oakthorpe Place. A donation wil be made to The Art Room charity for every tree sold. You can contact Flash Christmas Trees on 07846633957, flashtrees@gmail.com and Flash Christmas Trees on Facebook. Barclays Bank has announced that their branch on the Banbuy Road is to close on Friday 4 March 2016. The nearest remaining branches are in the city centre and Headington. The switch-on of the Summertown Christmas lights will take place outside Mayfield House, just by Savills on the Banbury Road, on Friday 4 December between 5:00 and 5:30pm. A St Edward's School brass band will play carols and will be joined by a choir from St Michael's. The children from Cutteslowe School will then sing some festive songs before the countdown to the switch-on begins. Do come along to this festive community treat and sample the fine mince pies provided by the Co-op. Carter Jonas, which was already the largest Carter Jonas office in the country, has just taken on a new sales negotiator to join its team. This follows the recent appointment of four graduates who are working towards becoming chartered surveyors, and the expansion of the firm's national GIS and mapping team by the appointment of Andy Williams. Mr Williams joined the company from the Royal School of Military Survey in Thatcham where he was a senior instructor and also chief geographic officer for the MOD’s support in the 2012 Olympics. Carter Jonas's mapping team also provides direct consultancy services for developers, investors, landowners, and the professional services industry. Much-loved pizzeria Mamma Mia on South Parade re-opened today after being closed for a facelift. The restaurant looks very smart with its fresh paint, 'Mamma Mia red' outside, and new floors throughout but still reassuringly familar. As the restaurant opened, owner Jon Ellse was told that it had won the Food Awards England award for Best Italian Establishment in Southern England. Commuters will be travelling from Oxford Parkway station at Water Eaton, just north of Summertown, to London Marlebone for the first time today. This is the first new rail link between a major British city and London for over 100 years The service, with a journey time of about an hour (see timetable), will make Summertown an even more attractive prospect for people who want the benefits of living in Oxford while working in London. Oliver Bonas has launched their new Christmas range of products. Click here for full details. A new LifeSTYLE boutique will be opening its doors on 12 November in the shop recently vacated by Eileen. The boutique is expected to offer, amongst other things, organic baby wear, a large range of household products and organic scenting and skincare products. When the new Oxford Parkway station opens at Water Eaton on 26 October, the Park-and-Ride 500 service will be extended. The revised service will run between the city centre and Water Eaton from about 5.30am to midnight on weekdays and there will also be a new Sunday service. The buses will also run from and to the main Oxford Station, providing a link between Summertown and both stations. St Edward’s School has announced that plans to build a new concert hall on the old Lemon Tree site on the Woodstock Road have been abandoned. A study carried out for the school found the venue would have needed a subsidy of more than £400,000 a year and would been in direct competition with places such as the New Theatre, the Sheldonian and the Oxford Playhouse. It is a pity that Summertown will not be the site of Oxford’s first purpose-built concert hall. We are sad to hear that Barefoot Books, the colourful and lively children's book and events centre in the old Twining's Building on Banbury Road, is to close at the end of the year. We understand that a large increase in the rent demanded for the building is the reason for their departure. We wish that landlords would not raise rents to a level that is unaffordable for independent businesses.This will be a loss for Summertown and we can only hope that an equally useful and engaging shop opens in its place. After a disappointing summer, the sun shone on over 200 cyclists meandering through Oxfordshire villages on Sunday 6 September. The group set off from Islip, all riding for a common cause, raising money for the Felix Byam Shaw Foundation. Rewards awaiting the cyclists on their return to the Village Hall included a fantastic barbecue with donations from local butchers, Alcocks and Fellers, and a brilliant raffle with prizes donated again from local North Oxford businesses, including Pophams, The Oxford Kitchen, The Old Parsonage, Daisies Flowers and a host of others. A substantial amount of money was raised for the causes close to Felix’s heart and the Foundation, friends and family would like to thank everyone who took part or contributed to this successful event. Four of Christie's specialists were at Strutt & Parker last night for a valuation evening accompanied by drinks and canapés. Information and valuations were given by the specialists on Chinese Art, Books, Maps, European Furniture, Sculpture and Jewellery. Guests were also able to view details of stunning properties, including ones offered by Strutt & Parker affiliate, Christie's International Real Estate. Please contact them if you would be interested in attending a future valuation event. Accountant Shaw Gibbs has raised over £2,500 for its chosen Charity of the Year, the North Oxford Association (NOA). 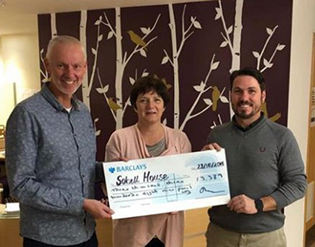 The funds, which were presented to the charity by Shaw Gibbs Managing Director Peter O’Connell, have been raised over the last twelve months from an array of activities organised by Shaw Gibbs employees. NOA Chairman David Potts said on receiving the funds, “We are thrilled to receive such generous support and are deeply grateful for the time and effort everyone from Shaw Gibbs has put in to raise these funds”. The next meeting of the Summertown Neighbourhood Forum will be at 7.30pm on Monday 21 September at the Baptist Church on Woodstock Road. Sir Muir Grey will be speaking on the links between a healthy environment, green spaces, and well-being. The organisers anticipate a lively discussion after the talk and all views and ideas will be taken into account in the compilation of the Neighbourhood Plan. The new, and officially recognised, Alliance Française d’Oxford opened its doors on 1 September. It offers French classes for all ages and abilities, and organises cultural events. The Directrice, Florence Rossignol, told us that the centre is open “for adult, teenage and children’s classes, for conversation classes or last-minute revisions, all conveniently located at our premises in North Oxford. Our friendly teachers, who are all French speakers and qualified to teach French, can also organise private classes for all ages. This term we have a selection of cultural events, from a book club to readings for children, a film showing and museum visits in French! Please visit our website for more information or send us an email”. Girls at Oxford High School in Belbroughton Road have bucked the national trend once more and achieved an increase in A* and A grades at A level with 54% of the Sixth Form achieving a clean sweep of A* or A grades. In addition, 75% of all the OHS students’ A Level grades were A* or A. A reminder that The Oxford Wine Festival starts a week today, on Friday 21 August, with 40 exhibitors including many of the UK's leading regional specialists, multi-award-winning English Vineyards, and hundreds of wines from the classic regions of the Old and New World. A full exhibitor line up is on their website. Savills in Oxford has nominated The Oxford Gatehouse as its charity of the year. The charity, based at St Giles Parish Rooms on Woodstock Road, has been supporting Oxford's homeless and poorly housed population since 1988. The team at Savills, which covers disciplines from residential and commercial property management and sales through to planning, development and rural services, has pledged to support the charity both through fundraising and ‘in kind’ donations. Fundraising kicked off this summer with, among other events, a star baker competition, plant sales, book shop and tuck shop. A Spinathon was held where 48 staff and guests pedalled 137,000 miles over 12 hours. More than £1000 has so far been raised and lots of other events are planned. Our local MP, Nicola Blackwood, last night criticised the 10% pay rise awarded to MPs and pledged to donate her extra income to local community causes. Tinei Mashaya will be demonstrating his beautiful Zimbabwean-style carving at the Turrill Sculpture Garden on Saturday afternoons from 2-4pm from tomorrow until 15 August. Travel Solutions, the travel agent on South Parade is closing tomorrow, Saturday 11 July. A letter from the owner explains that they have been unable to renew their lease because of development plans being pursued by the landlord. Customers with existing arrangements can still ring on 01865 310600 or email Charlotte on charlotte.m@travelsolutions.uk.com. Tickets for the North Wall Autumn 2015 season are now on sale covering a wide range of theatre, dance and music events that “pick controversial subjects, defy genre, mix things up and keep audiences on their toes”. Visit the North Wall site to view the programme and buy tickets. The Legge Oriental Carpets Summer Sale has begun with generous reductions of up to 50% off current prices. The sale ends on 25 July so visit soon to take advantage of the offers. The second annual Oxford Wine Festival will be taking place on the 21st and 22nd of August this year. The event will be bringing together leading wine merchants and specialists, and offers a great day out with live music and artisan food stalls at the Oxford Union. Chris Bowling, the managing director, told us that it will feature “an even wider range of wines and tutored tastings” than the year before. Early bird tickets are now available; visit the festival site to find out more. The Planning Inspector has given the City Council and St John's College the go-ahead for the development of the Northern Gateway site to the south of the A34/A40 Peartree interchange. The scheme involves building 500 homes, a science & research park and a hotel. The inspector dismissed concerns about building on the Green Belt, the increased traffic on the already over-full A40 and A34, and residents' concerns about the alteration to local amenity caused by this significant development. This decision could pave the way for the Council to pursue plans to build up to 4000 homes on land to the north-east of this site. Work on the Northern Gateway is expected to begin in 2018 and could last until 2026. We are sad to report that Eileen, the women's clothes shop on the Banbury Road, is closing down in two day's time after many years in Summertown. Further down the Banbury Road the shop which was occupied by The Powder Room is being converted into a shoe and accessories shop for the Moda in Pelle chain. A reminder that Robert Bullard will be passing on his tips for writing effective copy for websites, reports and press releases at a free talk at the Summertown Library on Thursday 18 June at 5.30 – 6.30pm. 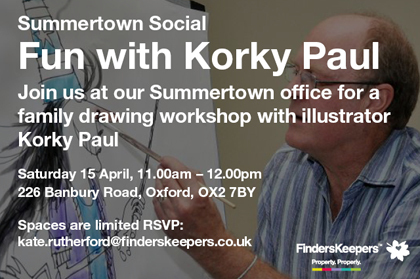 Donations are invited to support the fund-raising campaign of Friends of Summertown Library. Drivers have been warned to expect more than a year of delays as roadworks begin at the end of July on both the Wolvercote and Cutteslowe roundabounts. Work on the £9m scheme could last until November 2016 according to the County Council. The scheme will see both junctions becoming controlled by traffic lights, with approaches widened and new pedestrian and cycle crossings added. This could have a severe impact on local traders and businesses. The North Oxford Lawn Tennis Club is holding an Open Day with free coaching at the Banbury Road North Sports Ground, OX2 8EG on Sunday 14 June 9.30am-2pm. Click this link to book your space . All crossword enthusiasts are invited to Cracking Cryptics – a humorous and informative show about solving cryptic crosswords presented by Tony Long to be held at the NOA Community Centre, Diamond Place, on Saturday 13 June from 7.30pm. Tickets for the show cost £7.50 (including a glass of wine) and are available on the door, or click here to buy online. As part of Low Carbon Oxford Week, LCON are organising a talk by James Painter, Director of the Journalism Fellowship Programme at the Reuters Institute for the Study of Journalism, who will talk about whether the upcoming climate change talks in Paris will make a difference to the future of climate change. The talk will take place at the North Oxford Association annex, Diamond Place, from 7pm on Wednesday 17 June, and will be followed by the LCON AGM. We gather that estate agents Butler Sherborn are moving from the The Studio in Grove Street to 216 Banbury Road which was recently vacated by Hamptons. Robert Bullard will be passing on his tips for writing effective copy for websites, reports and press releases at a free talk at the Summertown Library on Thursday 18 June at 5.30 – 6.30pm. Donations are invited to support the fund-raising campaign of Friends of Summertown Library. Oliver Bonas opened the doors of their new Summertown shop last Thursday and are now getting ready for their Celebration Weekend on the 30th and 31st of May when they will be giving away a limited edition 'OB Oxford' tote bag to every customer who spends over £25. Students can also always get a 10% discount in store with their NUS card. Oxford Parkway, next to Water Eaton Park & Ride just off the A34, is the first new railway station to open in Oxfordshire since 1944. The first trains will run from the station to London Marylebone on Monday 26 October. The new station will have disabled access, 150 cycle spaces, 800 car parking spaces and access to buses serving the park and ride site. The launch will also see the opening of Bicester Village station, which will provide Bicester with more trains to London in addition to those currently running from Bicester North. They are also recruiting so, if you would like a job in the new shop, email your details to recruitment@oliverbonas.com. St Edward's School's former student Florence Pugh has landed a major role in a new drama series to be screened on US TV. She will star next to Will & Grace star Eric McCormack in Studio City to be aired on Fox. .
Johnson's Dry Cleaners on the Banbury Road have announced that they are closing on Monday 16 March. Any clothes uncollected at the date can be collected from their shop on the Woodstock Road. St Edward’s School has announced an amazing prize for its annual “Teddies 2-Wheeler” fundraising bike ride on 26 April. The person who raises the most sponsorship money for children's charity See Saw, will win a road bike worth £1400. Get that sponsorship rolling in! Country Life magazine has named Juliana Markeson of Carter Jonas as Best Woman Agent. She won the mock award following a freak event that left her blinded for a week. Just before a viewing, Juliana was hit by a stone thrown up by a lawnmower and sent crashing to the ground. Worried that her eye was bleeding, but reassured that it was simply streaming tears, she conducted the appointment and it wasn’t until the viewers had gone that she went to A&E. St John’s College, Worcester College and the property group Kier Ventures Ltd, are holding an exhibition at the Oxford Hotel, Godstow Road, Wolvercote, today from11am to 8pm and tomorrow from 9.30am to 6pm on the Northern Gateway proposals for 500 new homes, a hotel and 90,000sq m business park. The Summertown Neighbourhood Forum is anxious for everyone in our area to respond to the 'Have Your Say' leaflet which was delivered to every house. You can either return the paper form (which was part of the leaflet) or answer the questions online. The results of this survey will form part of the Neighbourhood Development Plan, and that Plan will be taken into account by the Council in planning decisions - so please do Have Your Say! New plans released by Oxford City Council reveal that the Council is now proposing extra parking spaces, shops and housing for the redevelopment of the Diamond Place site. Traders and shoppers will be delighted to hear that all the current public parking spaces will be retained, using a multi-storey car park, and about 20 more spaces will be added for new shops, restaurants and cafés. See here for more details. Summertown is one of the most sought-after shopping locations in Britain according to a report by The Local Data Company. Just 1.9% of shops and cafés are vacant compared with an average of 10.9% in the south east. See this article in the Oxford Times for more details. St Edward’s School has announced its annual “Teddies 2-Wheeler”. This sponsored bike ride, on Sunday 26 April, is great for the family, as the entrance fee includes breakfast, refreshment and entertainment throughout the day. You can choose to ride 100, 50, 25 or 5 miles to raise money for See Saw, the grief counselling charity for children, which is the school’s chosen charity this year. The first 200 people to raise over £50 will win bespoke cycling jumpers, provided by the professional team Tinkoff Saxo. Organizers have announced that the second annual Oxford Wine Festival will be taking place on the 21st and 22nd of August this year. The event will be bringing together leading wine merchants and specialists, and offers a great day out with live music and artisan food stalls at the Oxford Union. Chris Bowling, the managing director, told us that it will feature “an even wider range of wines and tutored tastings” than the year before. Early bird tickets are now available; visit the festival site to find out more. Hamptons have closed their estate agency at 216 Banbury Road and are now concentrating all their resources at their outlet at 257 Banbury Road. Shoe shop Charles Clinkhard, which has been been closed since before Christmas as a result of fire and smoke damage, is planning to re-open on Monday 2 February. Plans to convert the Cutteslowe roundabout at the top of the Banbury Road into a hamburger or donut junction, with traffic on the A40 going through the middle have been scrapped by Oxfordshire County Council. The report by The Oxford Times says that the roundabout will instead be controlled by traffic lights.